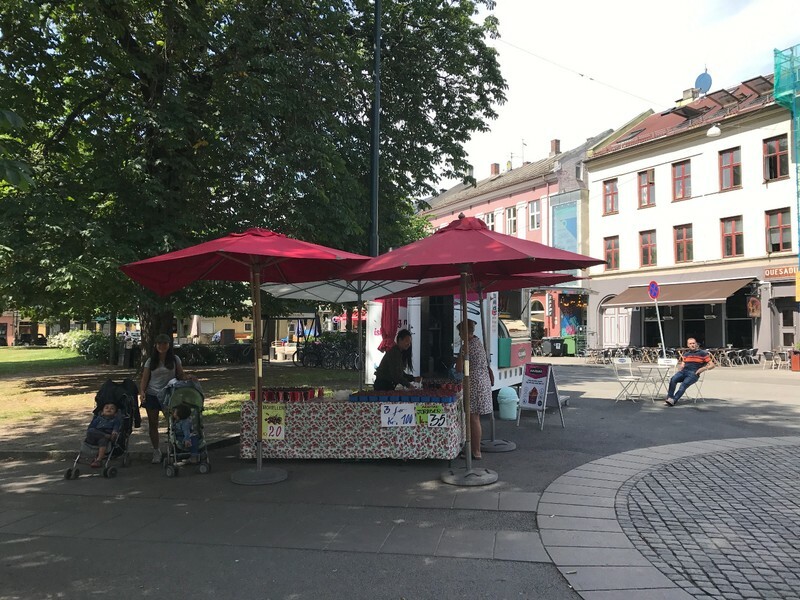 Stavanger is the third largest city in Norway but the population is less than a quarter million, which would make it an inconsequential small town in most other countries. We definitely got more of the small town feel when we arrived. Our Airbnb was perfect for us: clean, spacious, and simple. As with Bergen, most of the action was around the small harbor. The old town was adjacent to the harbor, on a little peninsula jutting out into the North Sea. We had a good dinner at 26 North, in the Radisson Blu hotel, the night we arrived. 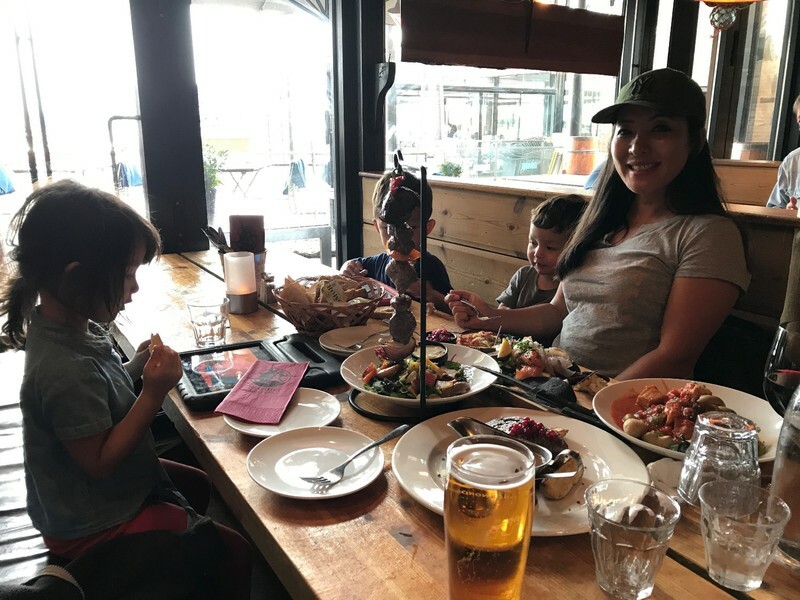 We were lucky to get a table in the busy restaurant without a reservation, even though it was mid-week. 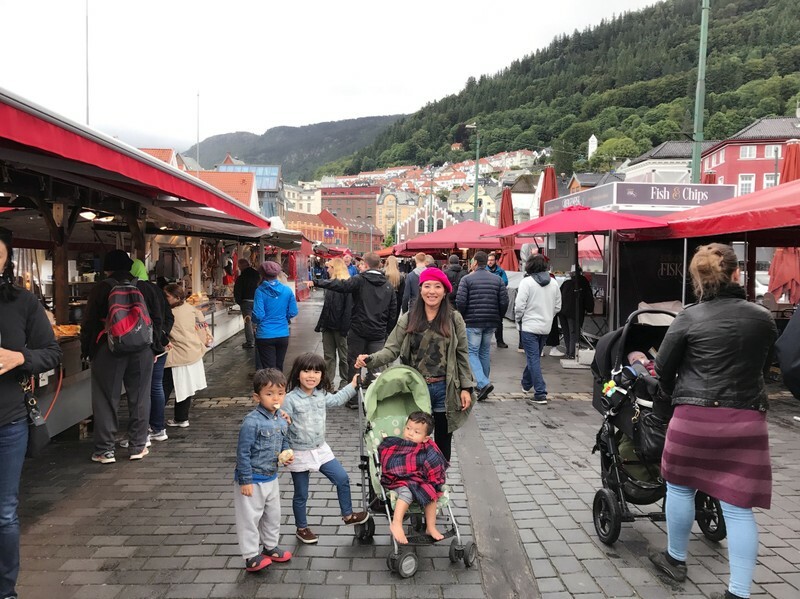 The next morning, we walked back down to the harbor area and found a miniature version of the wharf market in Bergen, except without the seafood stalls. All the seafood was in the market restaurant, but it seemed like a weak cousin of Fjellskål in Bergen so we gave it a pass. We checked out the small produce market nearby and then ate at a ramen shop at a shopping mall on the far side of the peninsula. 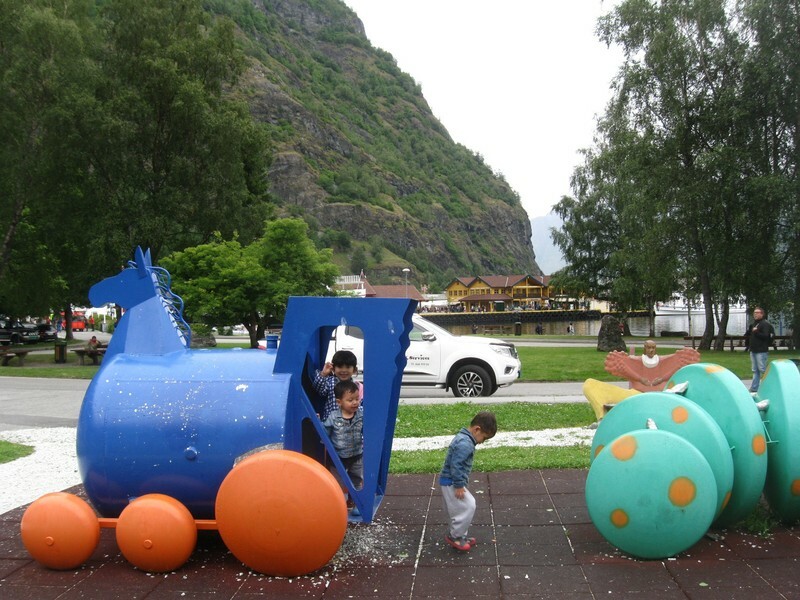 We had a little time to kill before our Lysefjord boat tour, so when we came across a cool playground called Geoparken we let the kids go crazy for an hour. All the playground equipment is made from discarded parts of oil rigs. It's not as dangerous as it sounds, hopefully! 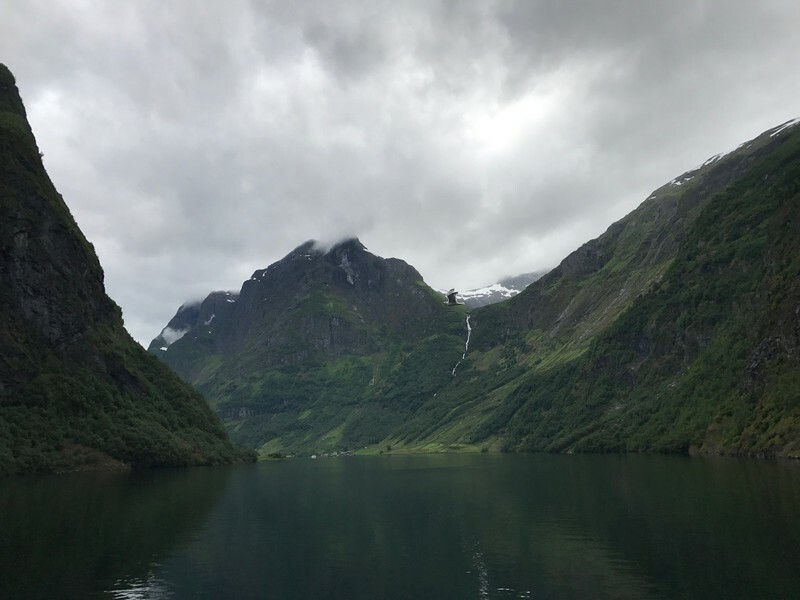 The Lysefjord cruise was a lot shorter and simpler than the Norway in a Nutshell tour, but I found it more scenic and enjoyable. Lysefjord's cliffs are breathtaking, jagged walls of granite that plunge directly into the sea. It was less overcast than it had been on our Sognefjord cruise as well, which made the water much more blue and reflective. 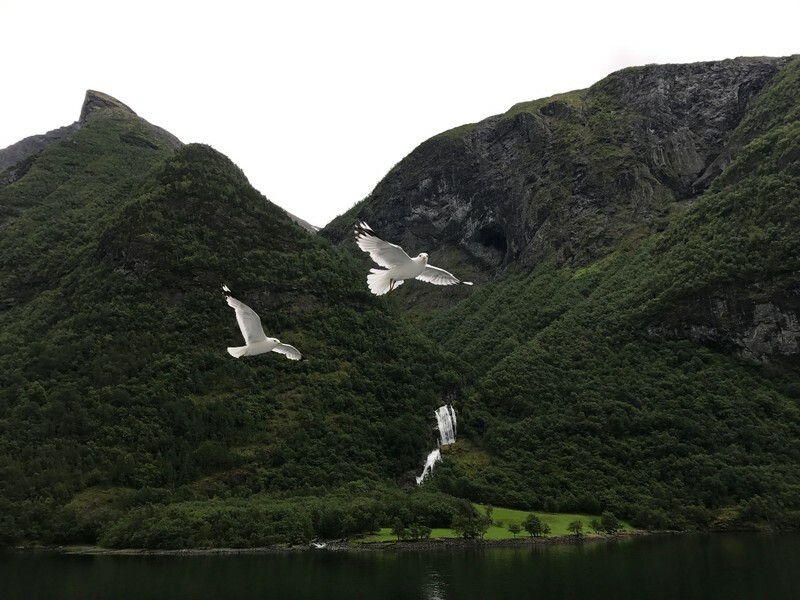 Some of the other highlights of the cruise were an interaction with friendly and hungry mountain goats, a waterfall close enough to soak us with spray, and a fjord's-eye view of Preikestolen. This rock "pulpit" which juts from the top of a high cliff is one of the signature rock formations of the Norwegian fjords. People hike up there in huge numbers in the summer months, but I can't even look at pictures of it without feeling sick to my stomach. I've seen videos of kids playing on the rock and even eating lunch with their legs hanging over the edge, but the thought of my own kids being up there is unimaginable. 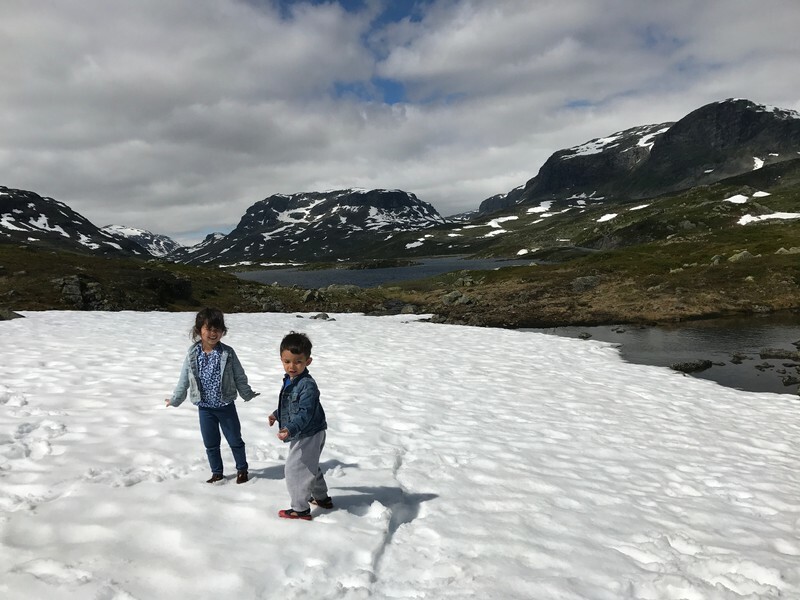 Fortunately, falls from Preikestolen and other popular formations like Trolltunga are extremely rare, with far fewer deaths than have occurred at American sites such as Half Dome. On our return we found the wharf area in full swing, with outdoor cafes full of customers despite the chill. The source of the crowd was clear, a huge cruise ship docked a few yards away. A fully-kitted rock band played on a stage next to the water's edge. We climbed the hill behind the wharf to the Valberg Tower, an old watch tower that once was the highest vantage point in Stavanger. We wandered back through the largely pedestrianized old town to the Ethiopian restaurant we had selected, which proved to be one of the better Ethiopian meals we've had. According to the owner, there's a good-sized Ethiopian community in Stavanger. The next morning we took one last walk down to the harbor and the old town. This time we got a closer look at Stavanger's Byparken. 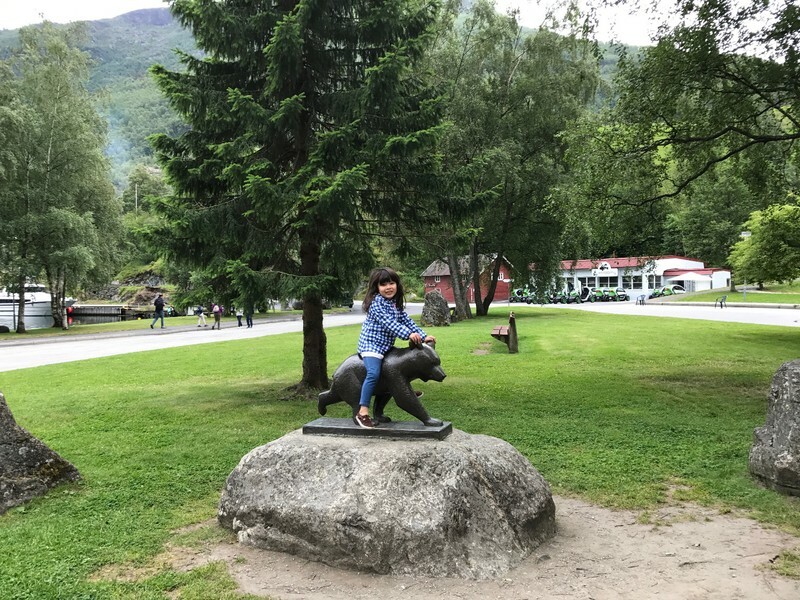 Like most of Norway's parks, it had its share of whimsical touches. Then it was time for a quick lunch and the three hour drive to our last destination in Norway. We only had two reasons to be in Kristiansand. The first was that it was the departure point for our ferry back to Denmark the next day. The second was Dyreparken, a combination amusement park and zoo that has a lot of positive commentary in guidebooks and online. We try and mix the things we want to do with stuff that will make the kids happy and help them remember the trips. Watching our kids have fun is a good memory for us as well. We arrived at the park at around four in the afternoon, which gave us three hours before it closed. We paid the rather brutal general admission prices, foregoing the waterpark which required a separate ticket. There were only a few rides that were free with admission, and they weren't particularly exciting although naturally our kids wanted to try all of them. We eventually got them away from the rides and walked to Kardemomme by, a miniature town based on a popular Norwegian children's book. There didn't seem to be much to that place either, except for a little train that did a quick circuit of the town. We ended up having to rush a little bit through the zoo, which was a pleasant arrangement of boardwalks through large outdoor exhibits. It was good not to have to see animals in cages, but of course the downside to that presentation is that many animals couldn't be spotted at all. On the way out of the park we found people standing in a long line for a luge ride that we'd missed earlier. Despite the line we managed to get a ride for each of the kids. The luge seemed quite fast and the track left the ground completely in sections which would have made for an interesting video, but unfortunately I wasn't wearing my video sunglasses for the ride. We located our Airbnb with some difficulty, and found the owner hadn't left us any towels or bed linens. The bedrooms were in the basement that could only be accessed via a ladder descending from an unprotected hole in the ground floor. Not ideal. We drove to downtown Kristiansand and found ourselves dinner at a mediocre tapas restaurant. The downtown pedestrian area was different from the other Norwegian cities we'd visited in that it wasn't focused on a wharf. We encountered the first neoclassical McDonald's I've seen as well as an energetic outdoor concert. Unfortunately, the security wouldn't let us into the concert with the kids but we were still able to enjoy the band from outside. 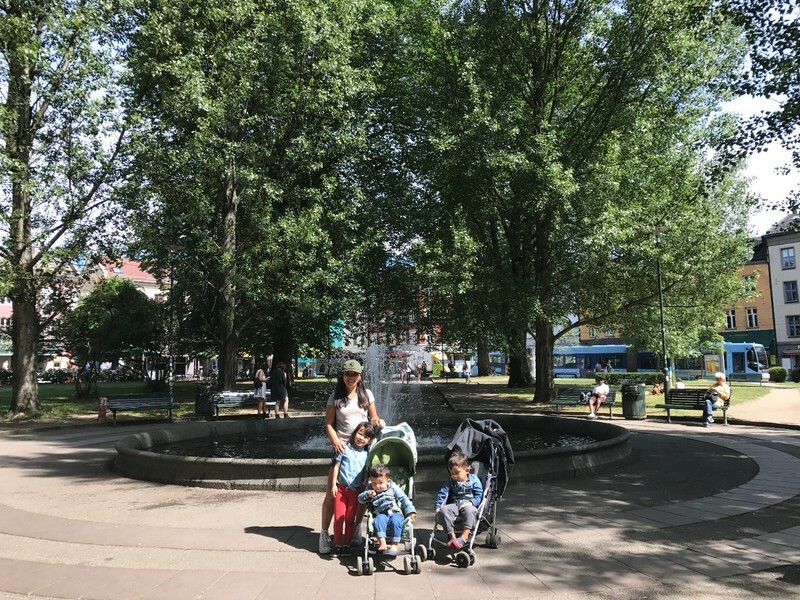 We followed what seemed to be the main street and eventually encountered a small park with a beautiful square fountain and grassy embankments for the kids to roll around on. Once they'd tired themselves out it was time to bring another busy day to an end. When we got back to the Airbnb, we immediately hustled the kids down to the basement to neutralize the hole-in-the-floor hazard. Fortunately the mattresses were clean so the lack of sheets didn't present too much of a problem. The ferry to Denmark didn't leave until late afternoon so we had a few hours to see Kristiansand in the day time. The historic quarter of town is Posebyen, the only neighborhood to survive a huge fire in 1892. Unlike the historic quarters of Bergen and Stavanger, Posebyen is very quiet and residential. We strolled up and down the main pedestrian street, and Spenser did his best impression of a chess piece. For lunch, we found a Mexican restaurant close to the train station which had a very unique interior decor. 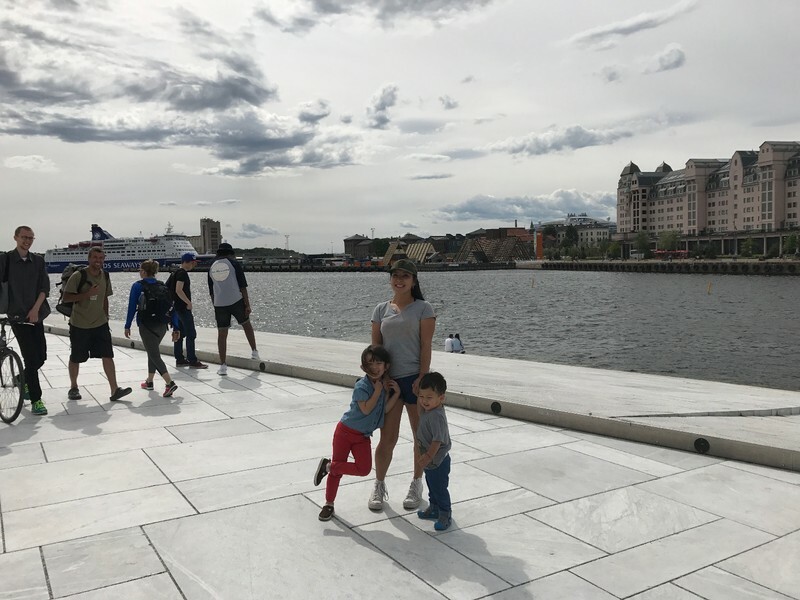 I was a little nervous about the three hour ferry ride to Denmark after our experience returning to Sicily from Malta, but the ride was smooth and there was a play area which occupied the kids. Cleo got a kick out of some Norwegian cartoon characters that were patrolling the ferry, although we had no idea who they were. We arrived on schedule at Hirsthals, in the far north of Denmark, but our day wasn't close to over. We still had to find dinner and get to Aarhus, two hours away. 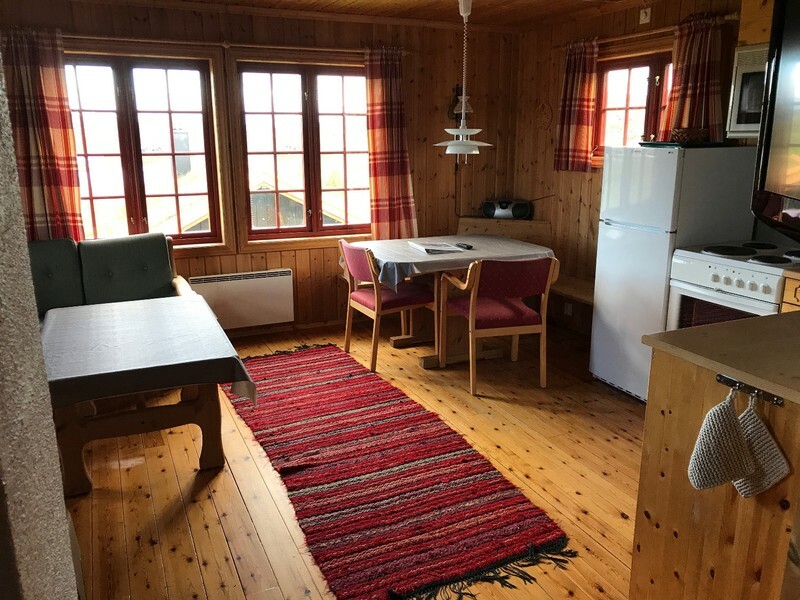 Our Airbnb in Bergen was a pleasant townhouse on a ridge overlooking the harbor and the central part of the city. It was one of those places where the owners obviously still lived there part time and left it in its usual lived-in condition when they were hosting guests. It worked out well for our kids since there were lots of toys lying around for them to play with. It was already dinner time when we arrived so we didn't waste any time driving down to the harbor in search of something to eat. I had a couple of restaurants written down but before we had a chance to check them out, we saw a cluster of red canopies along the pedestrian walkway at the eastern wharf. 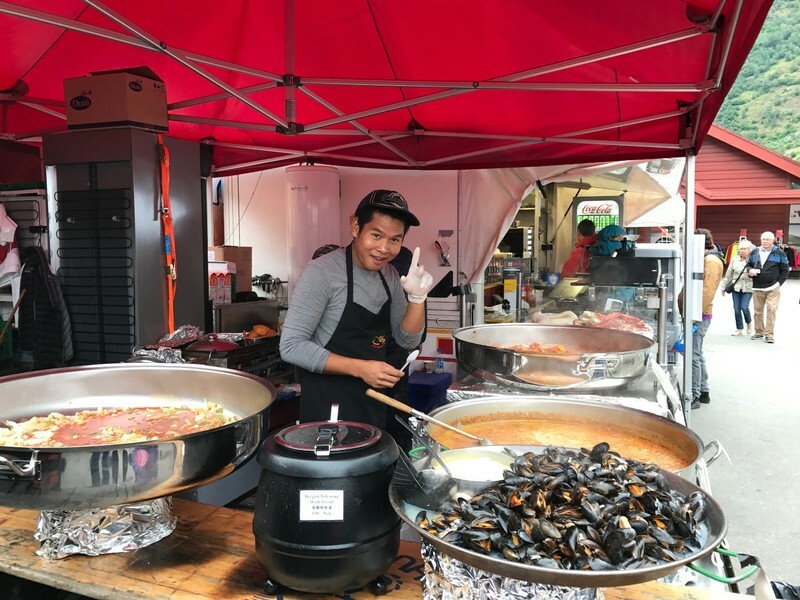 On closer inspection, we found that it was a street market with numerous stalls selling seafood as well as other dishes. We managed to get ourselves a pretty good seafood dinner including wolffish sashimi. After dinner we walked through the central part of the downtown area, enjoying the typically Norwegian townhouses and quirky sculptures that were everywhere we looked. In the morning we headed straight to the harbor and the combination seafood market and restaurant Fjellskål. 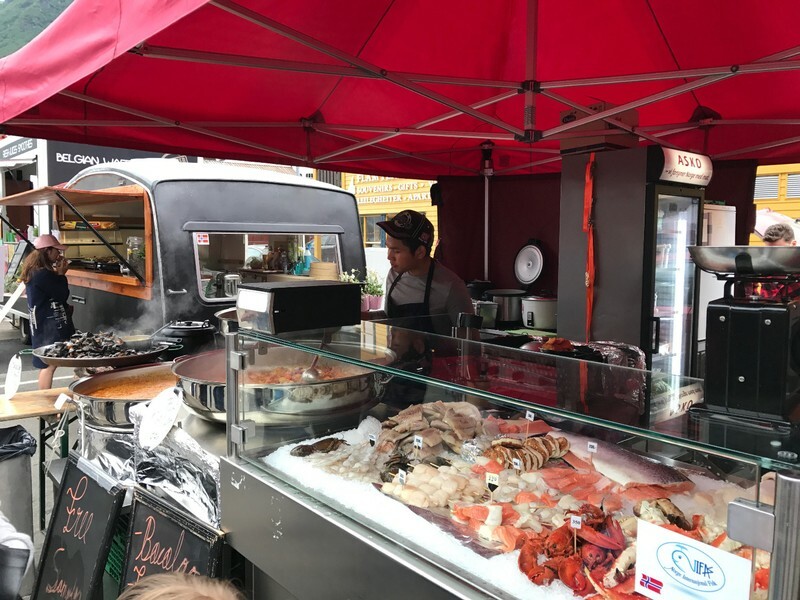 The market had all our favorites and the chef graciously prepared us a bespoke meal including a sashimi platter of whale and white fishes as well as broiled skate. The outdoor market around the harbor was already in full swing. We walked to the northern side of the wharf to see the preserved old houses of the Bryggen neighborhood. Like the old houses of central Malmö, most had been converted into galleries and boutiques. 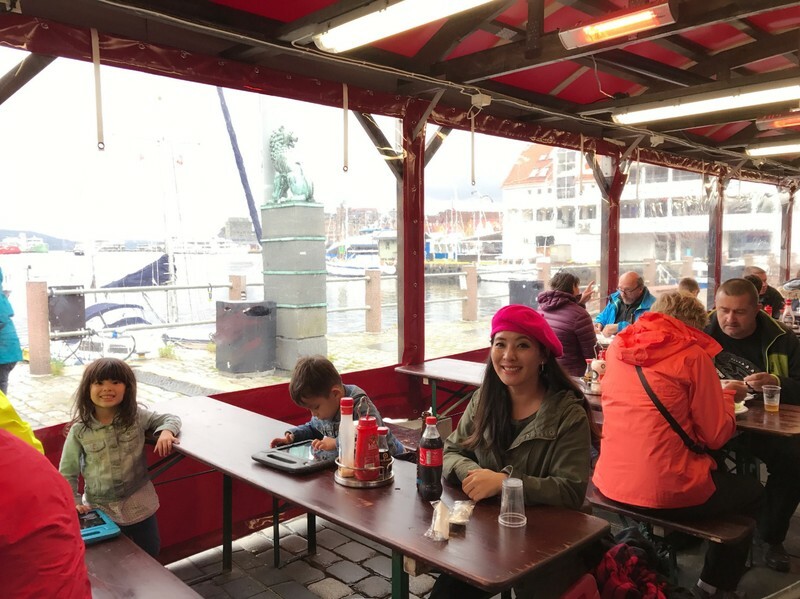 We decided to break away from the touristy harbor scene and found a more local vibe in the peninsular Nordnes neighborhood south of the harbor. The peninsula reminded me of Birgu in Malta to the extent that the ground rose steeply from the water to a central ridge. At the very top was a little yellow church. The houses in Nordnes were just as pretty as the ones in Bryggen, but the area had a much more warm and residential feel. 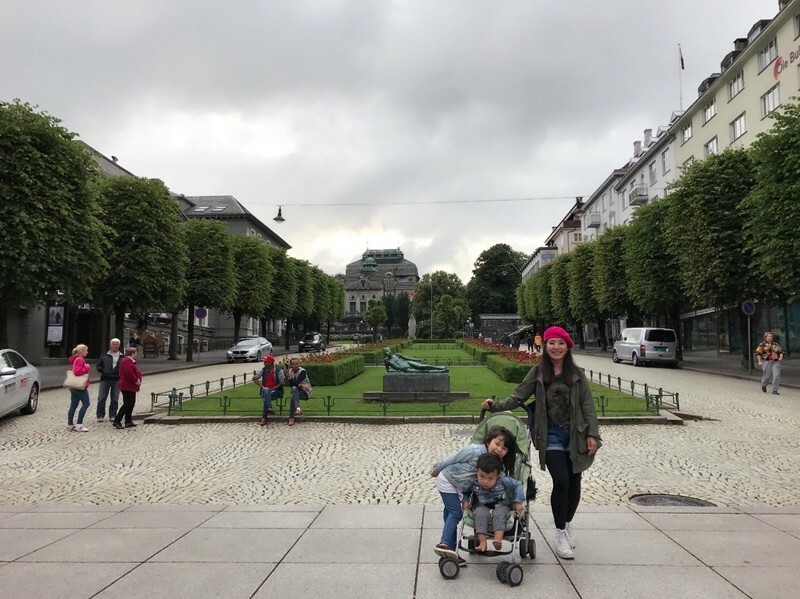 Returning back eastward, we found ourselves at Bergen's downtown park Byparken. The park was a beautiful open green space with an ornate gazebo and a large pond that was home to hundreds of seagulls. 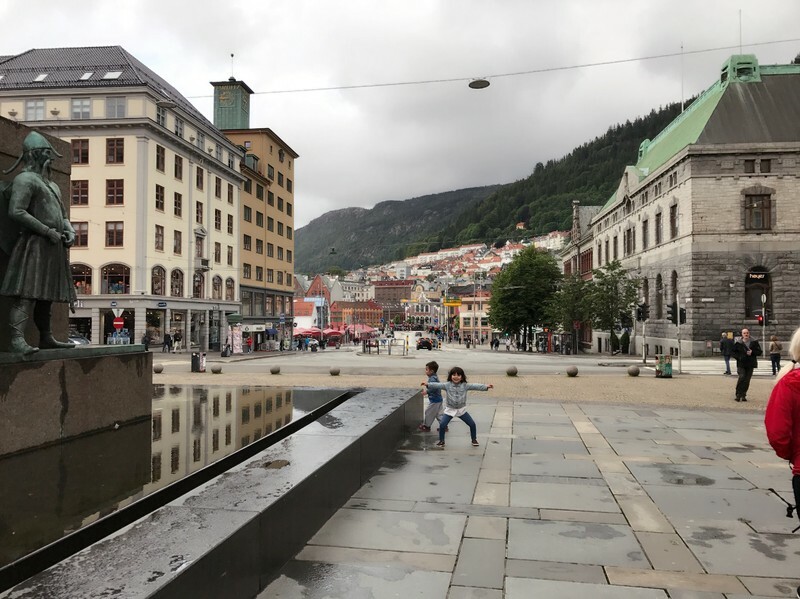 We'd seen most of downtown Bergen at this point and it was getting into mid-afternoon, so we decided to take the Ulriken643 cable car to the top of Mt. Ulriken, the highest of the mountains that surround Bergen. At the top of the mountain was an overlook over the city and the North Sea beyond, as well as an incongruous collection of exercise equipment. Behind us little trails twisted into the rocky hillsides, and we saw people and sheep scattered around the distant landscape. We couldn't resist the instinct to explore and headed down the most promising path. We made some pretty good headway along the choppy trail and eventually summited a hillock with far-reaching views over the otherworldly landscape. We returned and descended in the cable car feeling a warm sense of accomplishment. The following morning we took our leave of Bergen. On the way out of town we stopped at the Fantoft Stave Church, which is a replica of a replica of a church that was initially constructed in 1150. The destruction by arson of the prior version of the church is a story almost too complicated and bizarre to be believed. Inside the church, Cleo asked me why Jesus had been crucified. Fortunately, I already knew the answer from The Hitchhiker's Guide to the Galaxy. "Because he said people should be nice to each other for a change", I told her. Just outside of town, TripAdvisor guided us to lunch at an unusual restaurant that was an homage to American 50's style. Part of the restaurant was a real yellow school bus that had been built into one wall. There was also the requisite jukebox and Elvis statue. The food was pretty good as well, if more American than Norwegian. The drive to Stavanger took up most of the rest of the day, in no small part due to two ferry crossings. 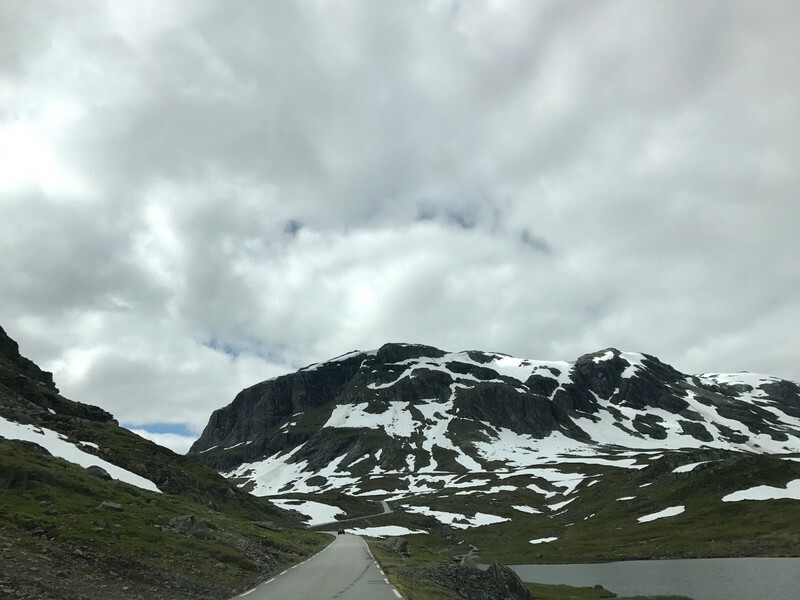 It was a good reminder of why we usually try not to drive more than three hours between destinations on our European road trips, but fortunately it was the only long drive of the trip. 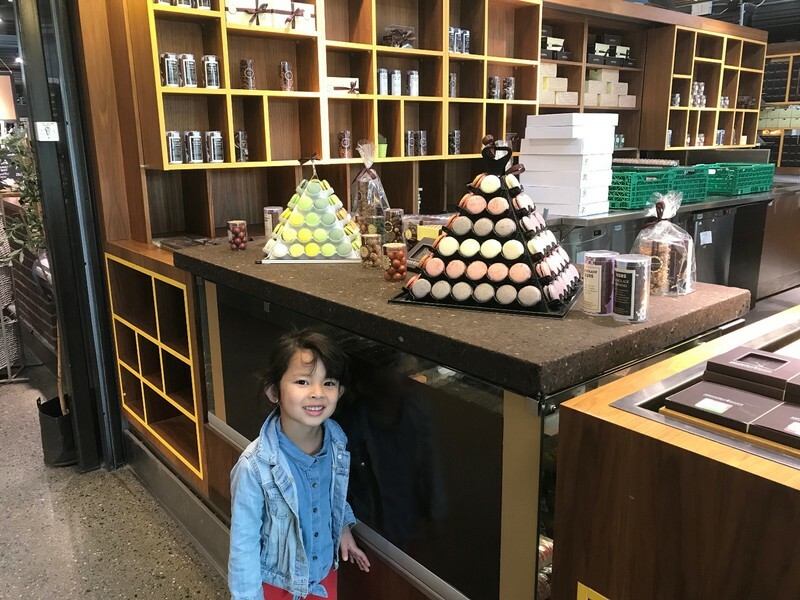 We had dawdled so long at the playground and the noodle shop in Oslo that I was worried we weren't going to make it to our first inland destination before it closed. 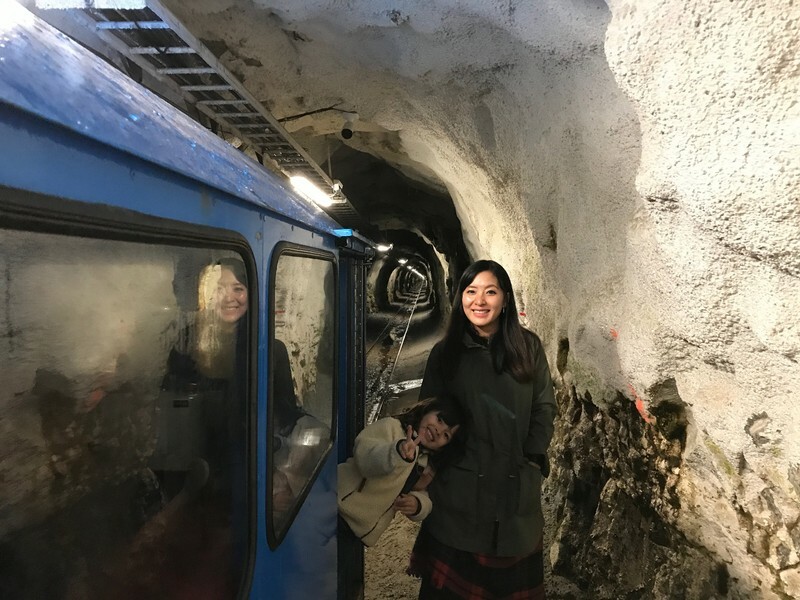 The Gaustabanen cable railway was constructed in the 1950's by blasting a tunnel straight through the heart of 6200 foot Mt. Gausta, in order to simplify access to a NATO radio tower that had been erected at the summit. The radio tower was rendered obsolete by the end of the Cold War, but the railway has been renovated for the purpose of tourism. The views from the summit were reportedly spectacular. Gaustabanen's closing time was listed as 6 PM, but I was worried that we would arrive after five only to be told the last funicular of the day had already departed. 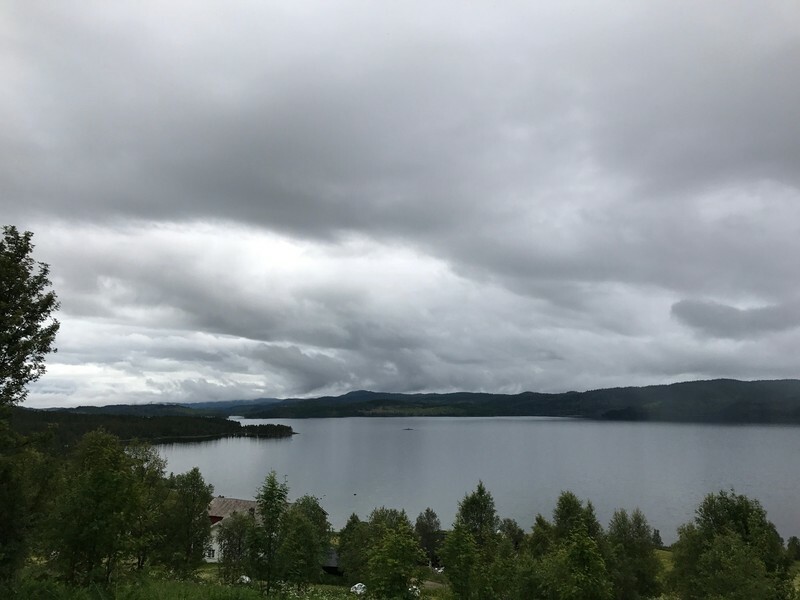 I kept a watchful eye on the clock as we zipped westward from Oslo, first on the E134 highway and then on the smaller and twistier 37. Our route took us through some beautiful landscape of rolling hills blanketed with low-lying vegetation. We arrived just before five, but I needn't have worried. The Gaustabanen runs on an as-needed basis right up until six. 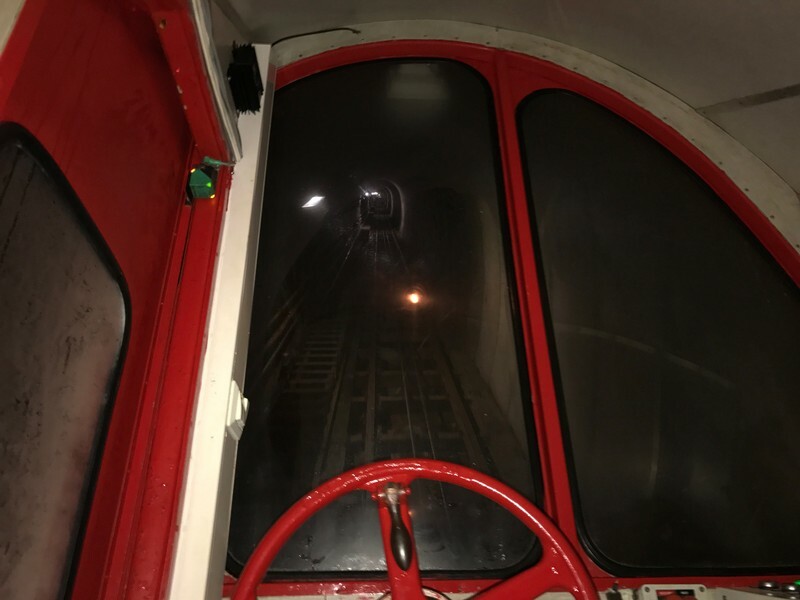 We were the only ones there when we arrived, so after buying our tickets we were guided directly to the blue train that runs horizontally into the heart of the mountain where the funicular awaits. Fortunately, I didn't let myself be fooled by the mild temperatures at the base of the mountain and we all got layered up into the the warmest clothes we had brought with us. Once we arrived at the top, the wind gusts made us thankful for every fiber of material that came between our skin and the elements. Unfortunately, there was absolutely no visibility at the summit. 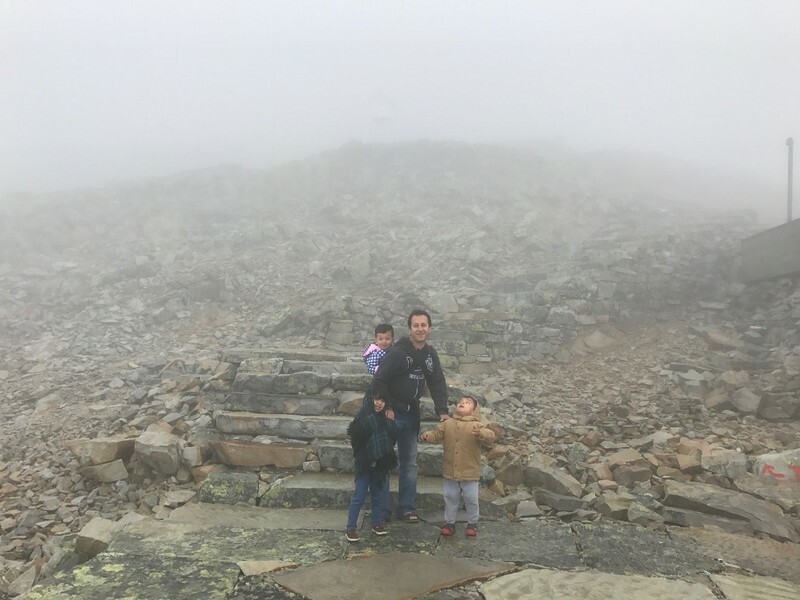 The mist was so thick I was afraid to let go of the kids thinking that if they took more than two steps away they would disappear completely. 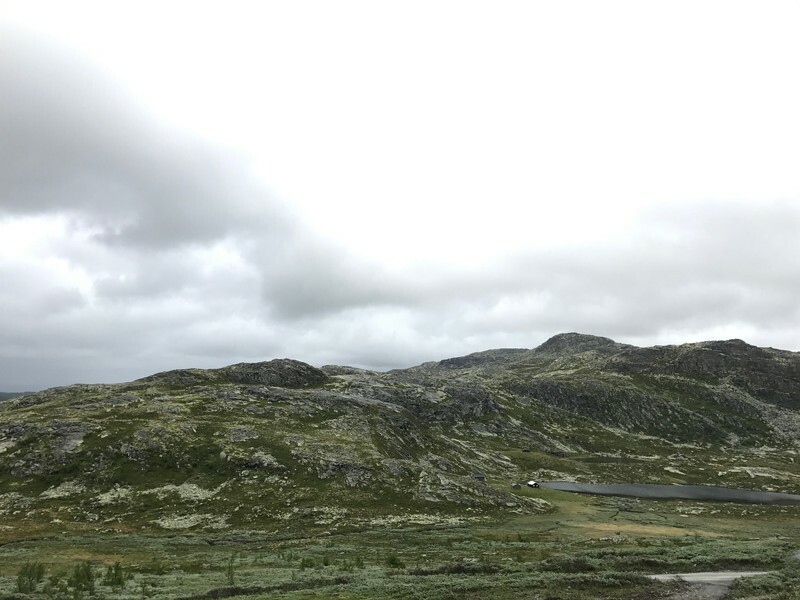 Despite the lack of a view, I was glad we'd made it to Gaustabanen in time to have our adventure. From Gaustabanen it was just a short, scenic drive to our cabin in Rauland. It was a very comfortable place with a wood-burning stove, which I was grateful not to have to utilize in the relatively balmy July weather. We found an appetizing restaurant nearby on TripAdvisor, but despite arriving just after seven we found it already closed. The few other restaurants listed nearby didn't seem to exist, and we soon found ourselves contemplating eating service station sausages for dinner. We finally found someone who clued us into a summer resort that had a dinner buffet, which proved to be awful with the highlight being cold and greasy pizza. The kids didn't mind it however, which was the most important thing. There were plenty of games for them as well. We had a good sleep in the cabin and had a little walk around the campsite in the morning. 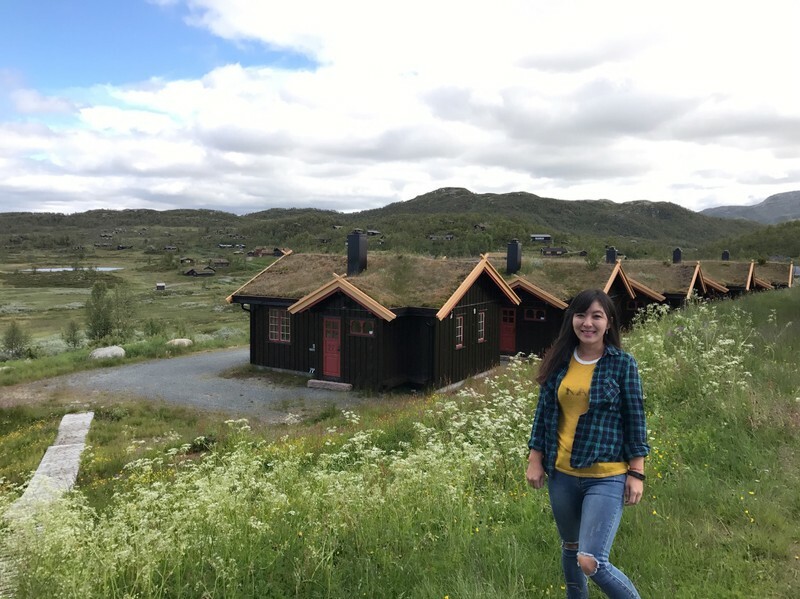 The cabins had sod roofs which were thick with grass and small plants. 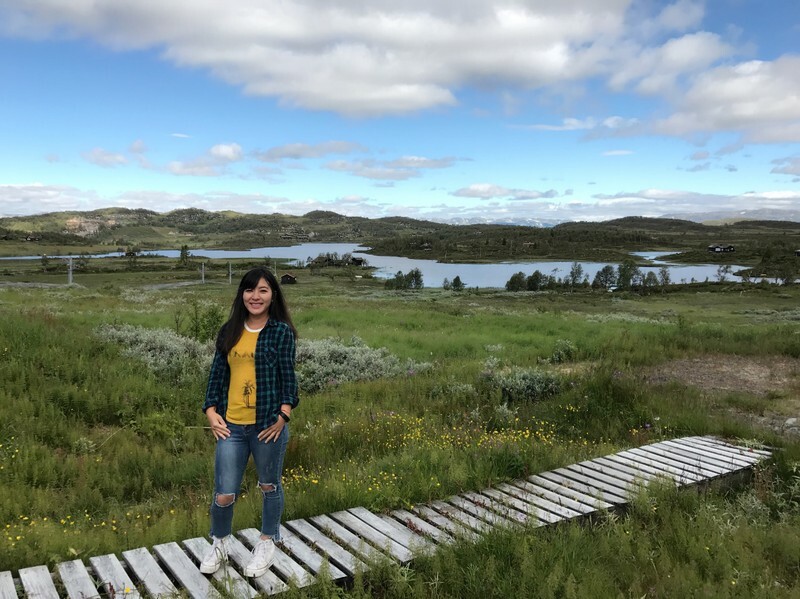 We could see farmhouses and barns scattered around the scruffy little lake nearby. 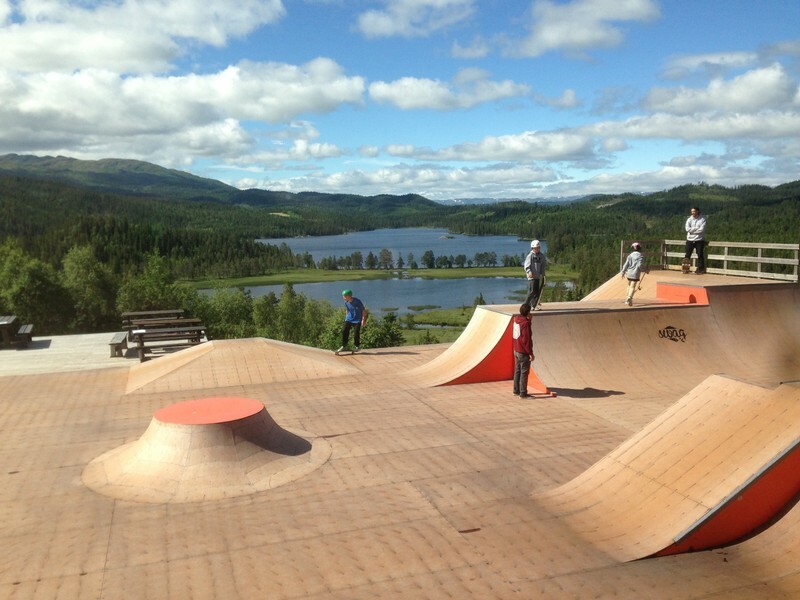 When we checked out, I was surprised to see a fairly elaborate skate park behind the main lodge. The westward drive proceeded slowly, partly because of the winding one-lane road and partly because we couldn't seem to stay in the car. It seemed like every time we rounded a curve, there was a new spectacular view that we had to get out and take pictures of. We were excited to see snow on the ground, which as Floridians we're not very familiar with. Eventually we found some patches that were big enough for the kids to get out and play in. It was Ian's first time ever touching snow, and Cleo's second after Andorra the previous year. It was hard to get them back in the car. Later on, we began to see some flocks of sheep on the hillsides and some in the middle of the road as well. 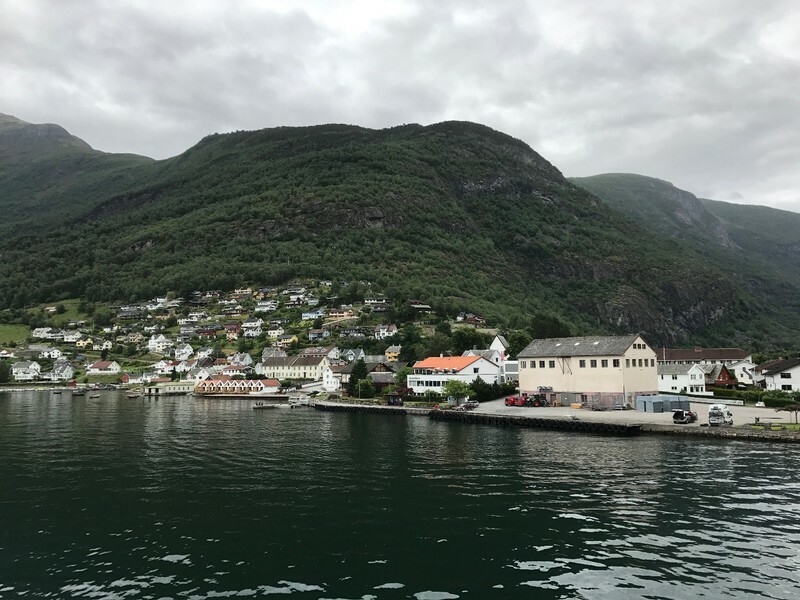 In the late afternoon we passed through Odda, a small town at the very tip of the Sørfjorden branch of the famous Hardangerfjord. We had finally reached the fjords of the west coast, although we were still an hour and a half from our final stop of the day. 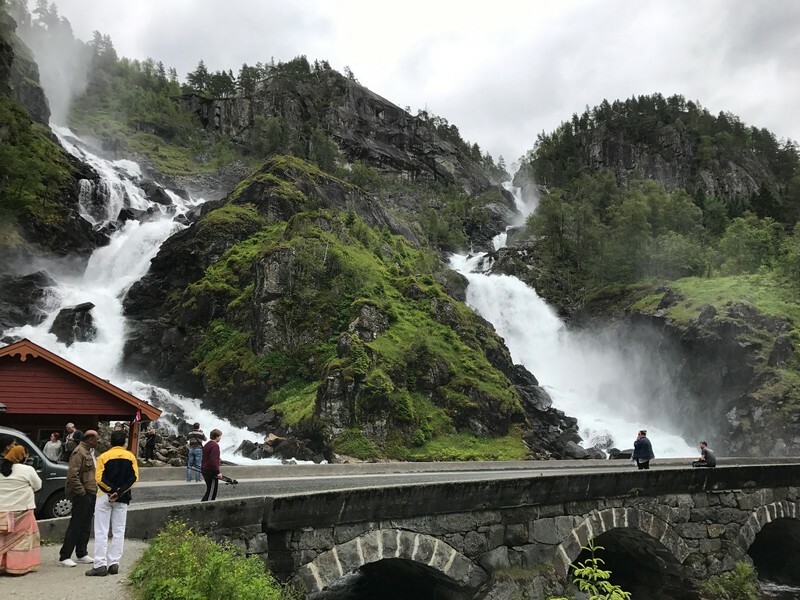 Odda is best known for the Låtefossen waterfall where two separate falls join together just as the water courses under the bridge we drove in on. 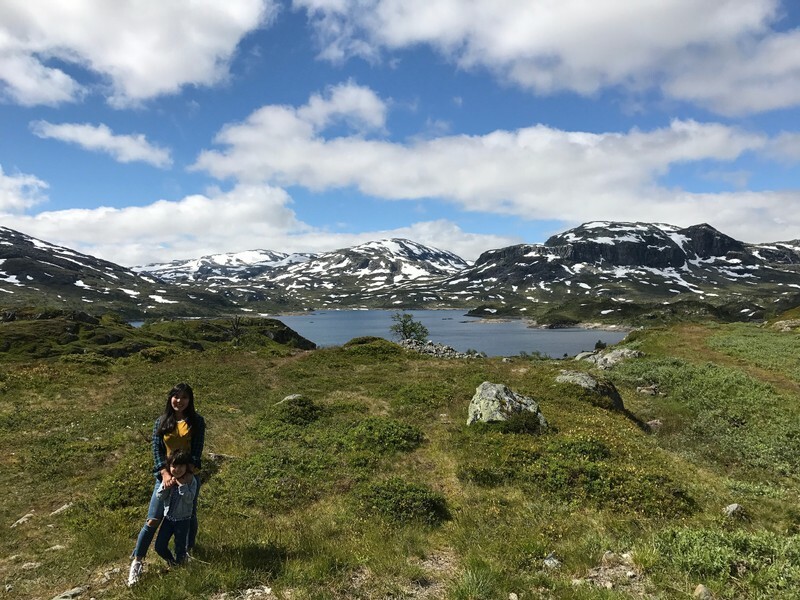 Odda is also the jumping off point for hikes to Trolltunga, one of the best known rock formations in Norway that for many reasons was not even remotely close to being on our list of things to see. 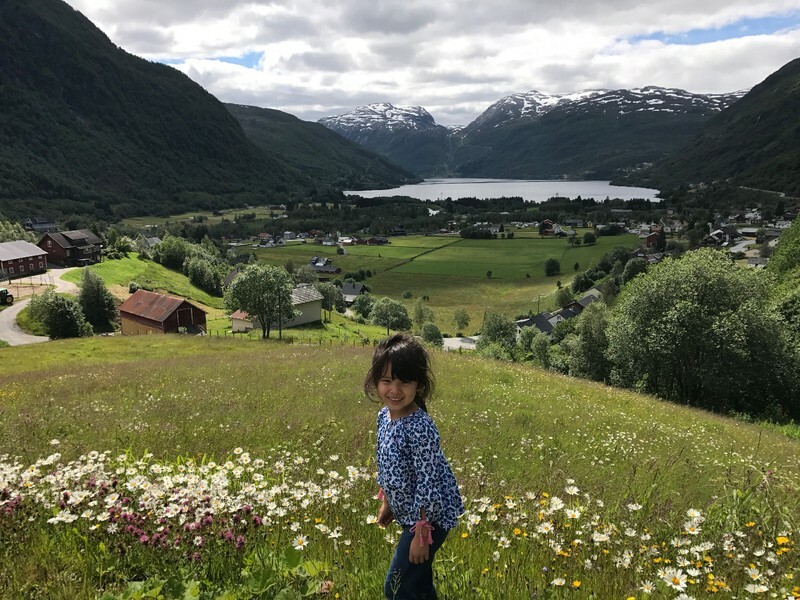 We decided to take a quick look around the town of Odda and were lucky to find a small road that ascended to the top of a hill that was the home of the Vikinghaug apartments. The views over the valley and fjord beneath us were breathtaking. Our final leg of the drive was almost entirely alongside Sørfjorden. 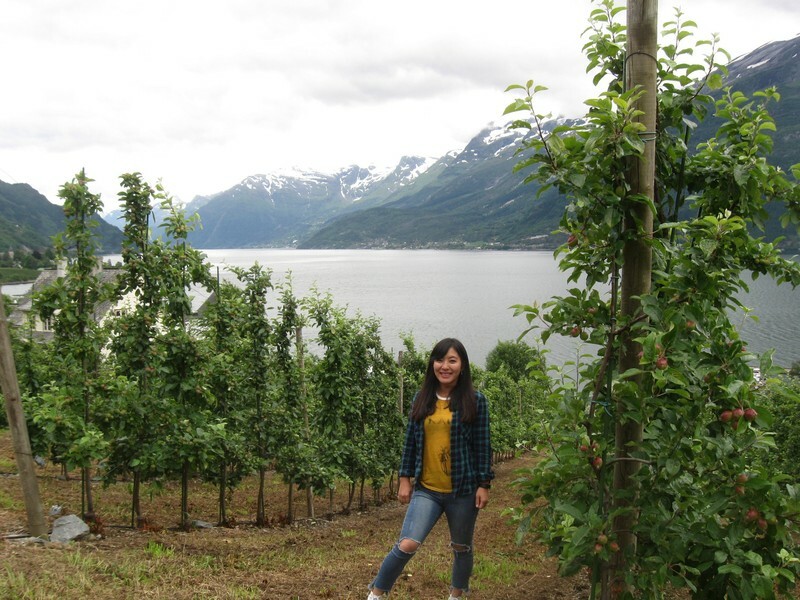 We took a couple more stops to admire some orchards and pick cherries at a campsite. 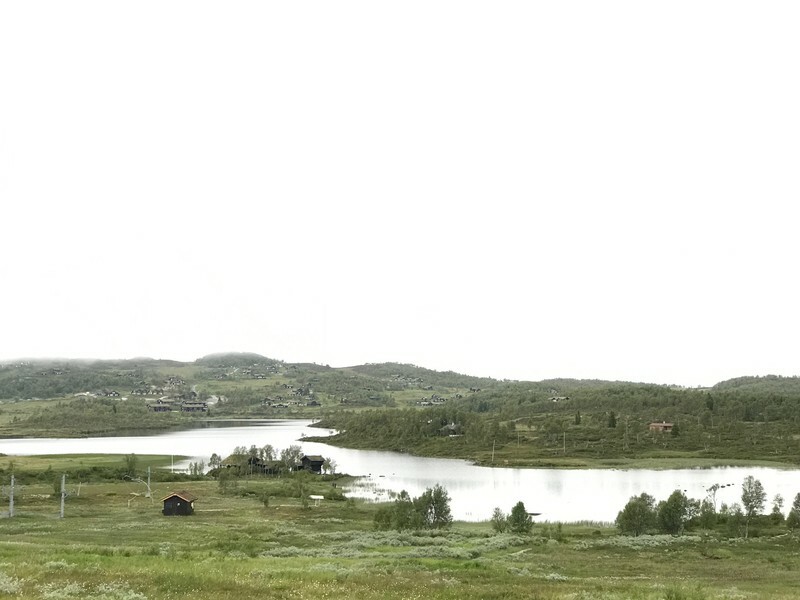 Finally, after a long day of driving and communing with nature, we arrived in Vossvangen. Vossvangen was a small town as well but it was big enough to have a small downtown and some decent restaurants for the tourists who pass through the area. 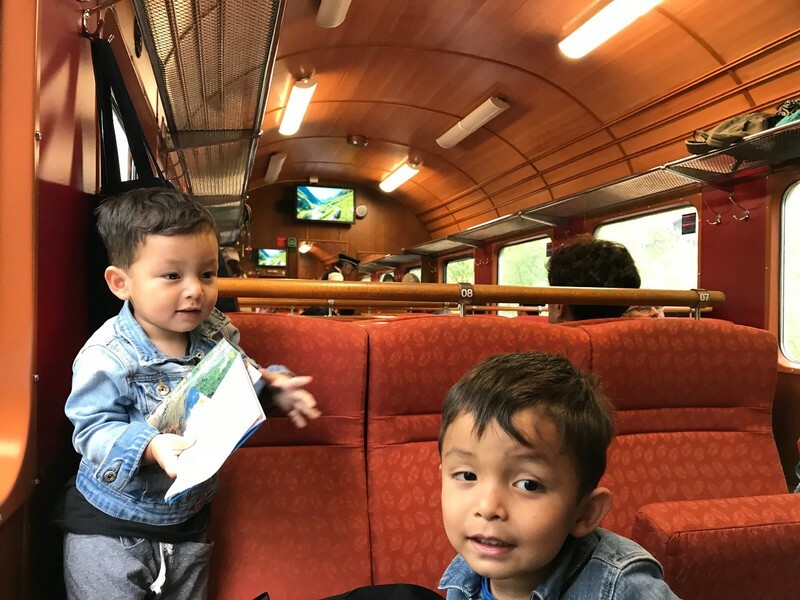 We had a good seafood dinner at Malin Restaurant & Sushibar and then scoped out the train station where we would begin our Norway in a Nutshell tour in the morning. This would be the only part of our trip that we had prearranged. 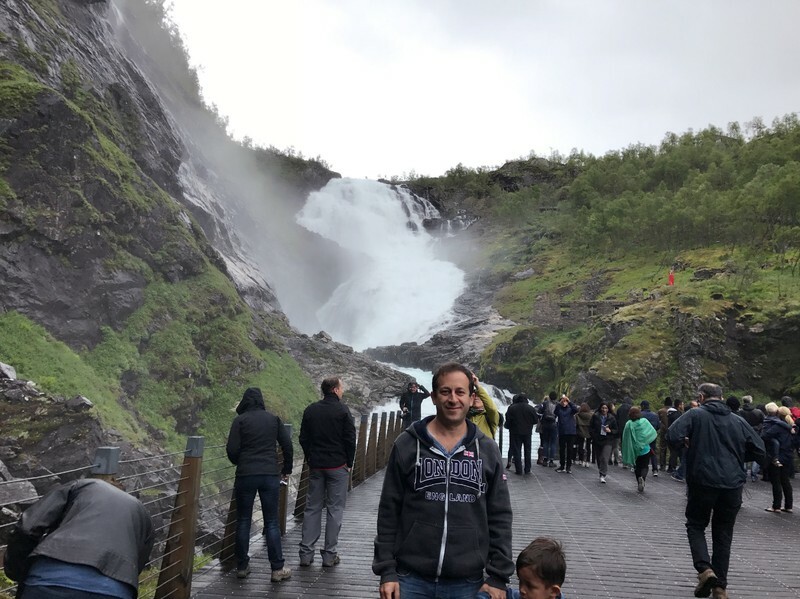 These tours are generally considered to be the best way for DIY travelers to see the fjords and scenery of Norway's west coast. 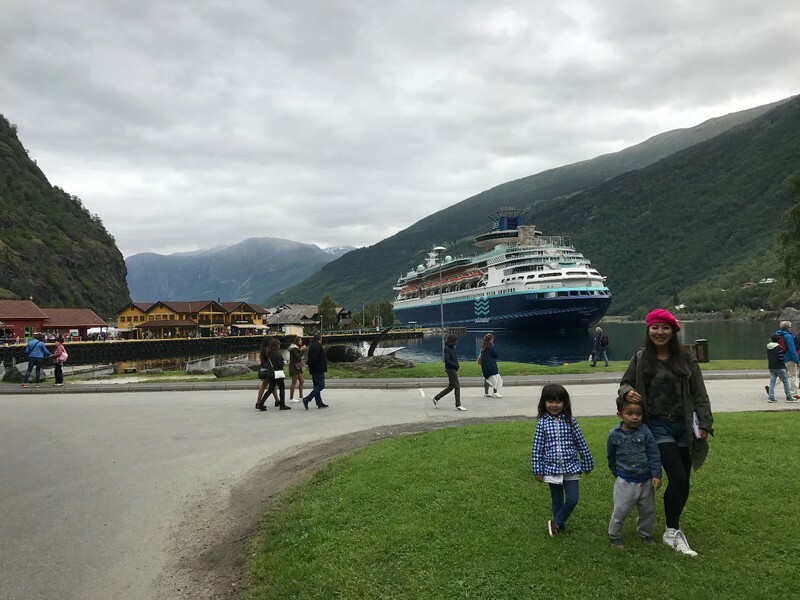 We had signed up for the original tour, which would take us into the Aurlandsfjorden and Nærøyfjorden branches of Sognefjorden, the largest fjord in Norway. One of the good things about the Norway in a Nutshell tours is that they're very flexible. You can begin the tour in several different cities on the route, and begin the round trip in either direction. 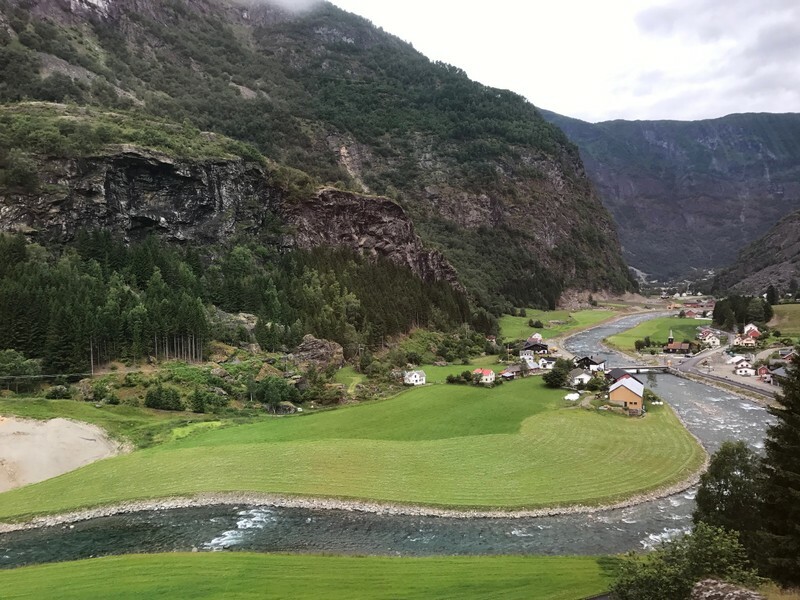 We started with the two train trips, first to Myrdal via the Bergen railway and then to Flåm via the Flåm railway. 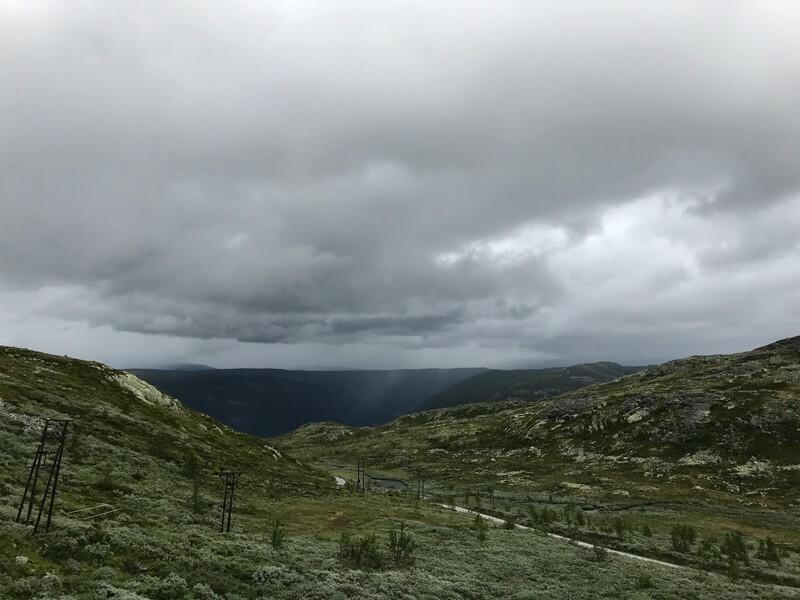 The Flåm railway was the more interesting of the two, with distinctive throwback cars and beautiful scenery visible from either side along the route. At one point the train stopped at a viewing platform for one of the larger waterfalls in the area. In Flåm we had a two hour layover before catching the fjord cruise. We didn't really see much in the way of a town there at all, but rather a cluster of restaurants and boutiques around the cruise ship dock. 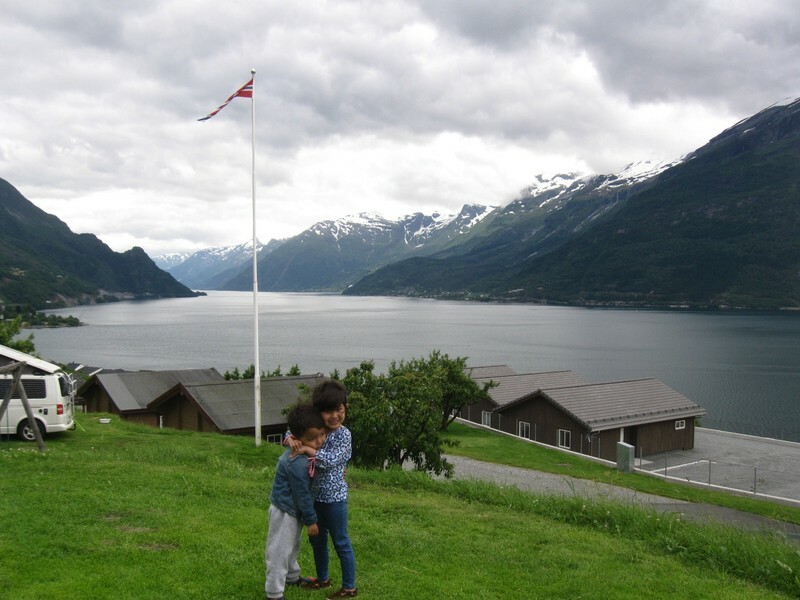 The setting was quite beautiful with green mountains and cliffs surrounding the serene fjord. Even the huge cruise ship looked sleek and colorful, if somewhat incongruous in the bucolic surroundings. We had a very good lunch of traditional Norwegian food at Bakkastova Cafe . We let the kids stretch their legs in a rather quirky little playground near the water and then headed to the dock area. There we found a miniature village of food vendors and craft sellers. The seafood stew was so enticing we couldn't resist it, even though we'd just had lunch and the prices were hair-raising. The cruise itself was fairly sedate, with the expected views of charming coastal villages and imposing cliffsides that rose right from the shoreline. People on the deck were hand-feeding seagulls which hovered against the splendid backdrop. 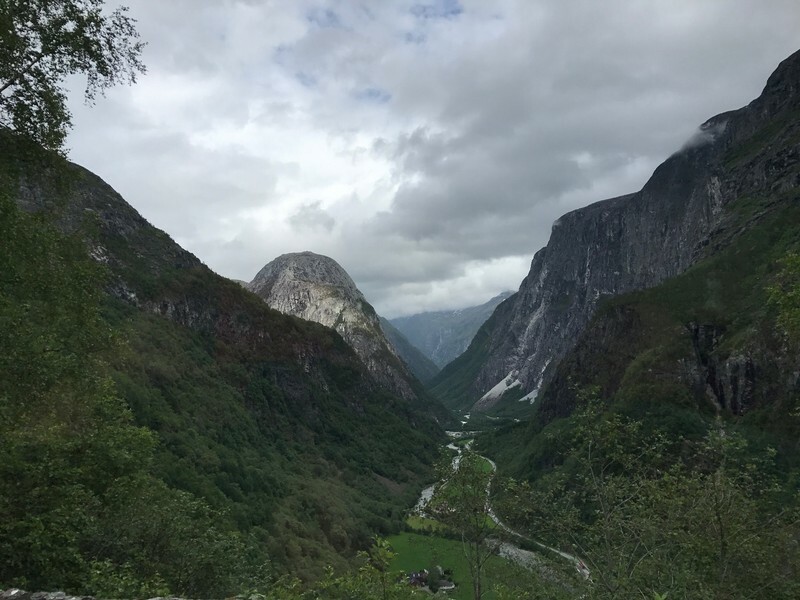 The last leg of the tour was a bus ride from Gudvangen back to Voss, which was most notable for the bloodcurdling ride down a steep mountain road filled with hairpin turns and views of waterfalls on either side. I was lucky enough to get the shotgun seat which felt somewhat like being on a roller coaster at an amusement park. Finally we found ourselves back at our car in Voss with all our bags still safely inside. 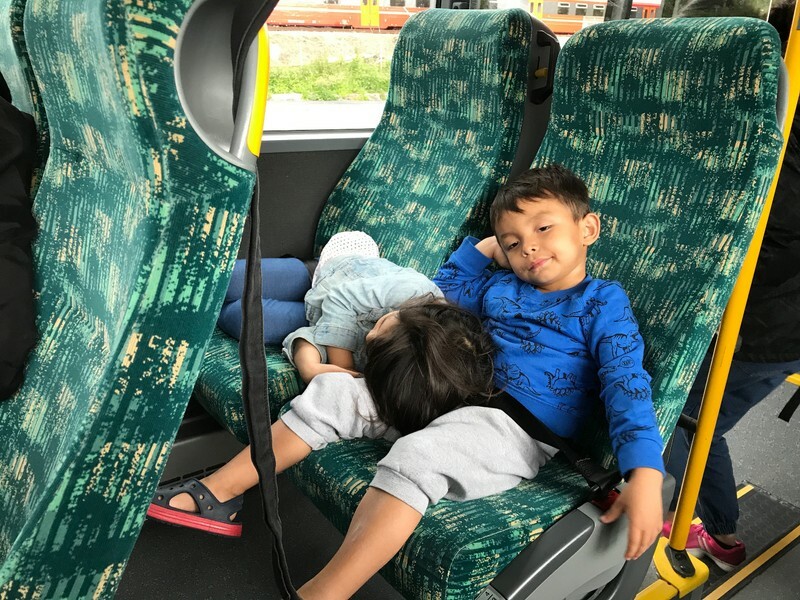 The kids were able to relax in their familiar car seats while I began the hour and a half drive to Bergen. I wasn't really sure how much to expect from Oslo. I'd always written it off as one of the expendable European capitals, an unnecessary destination even if one wanted to feel like an experienced European traveler. Of course, once we decided to go and I began to research the city, I found a lot to like about it. 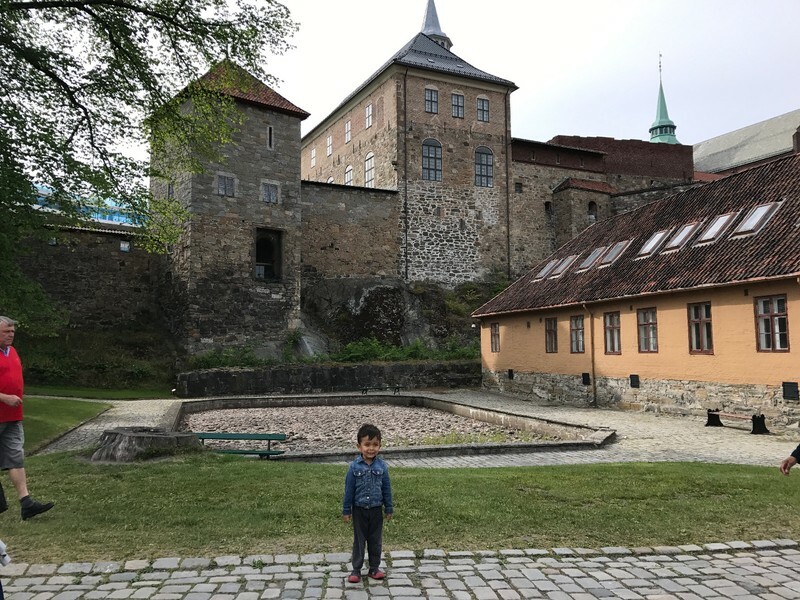 We used our typical two day stop for mid-sized cities in Oslo which turned out to be perfect. I was prepared for my Danish and Swedish SIM cards not to work in Norway, but we still had a difficult arrival in Oslo. Our GPS had some difficulty negotiating a highway exit once we were in the city and we drove aimlessly around a barren industrial area for a while, unable to find any way out of it. Once we arrived at the residential complex of Pilestredet Park, we realized we had an apartment number but no building number. Sure enough, our SIMs didn't work and we had no way to communicate with our hosts. Eventually Mei Ling found an open Wifi and our hosts directed me to the right building, but once I arrived on the floor I found that only one of the apartments had a number on the door. I spent some time trying to extrapolate where our apartment would be located based on the most logical numbering plan, and then our host arrived just as I was preparing to knock on the wrong door. 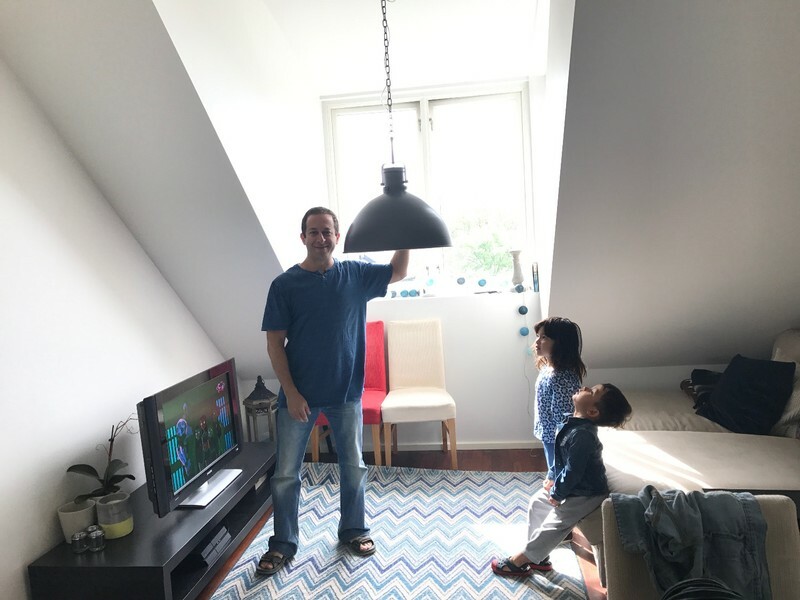 The Airbnb was a cute little place with a loft and a heavy, low-hanging light fixture that my cranium was to become intimately and repeatedly acquainted with. I was excited about having dinner at Elias mat & sånt in the city center because I knew they had reindeer stew, which I pictured as being very hearty and gamy. 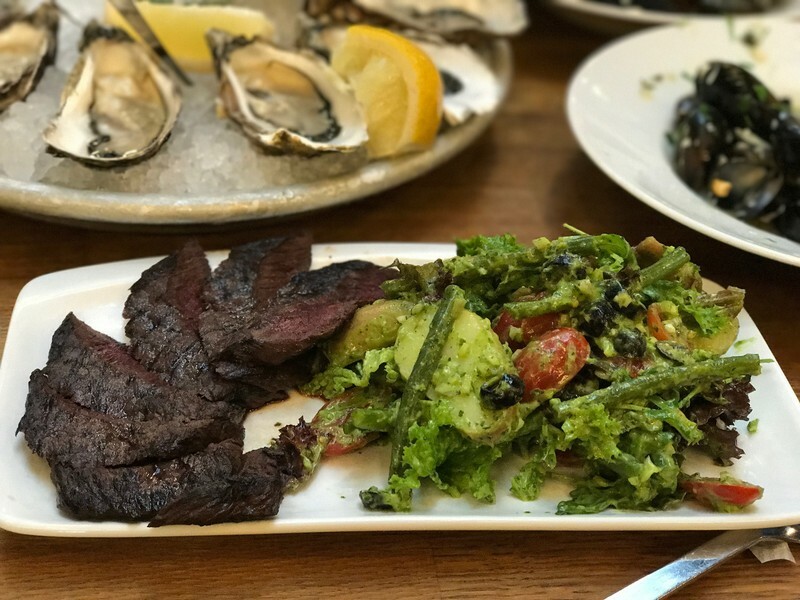 In fact, it proved to be rather flavorless and forgettable along with the rest of the meal, so that made two restaurant dinners in a row that hadn't been worth the trouble. 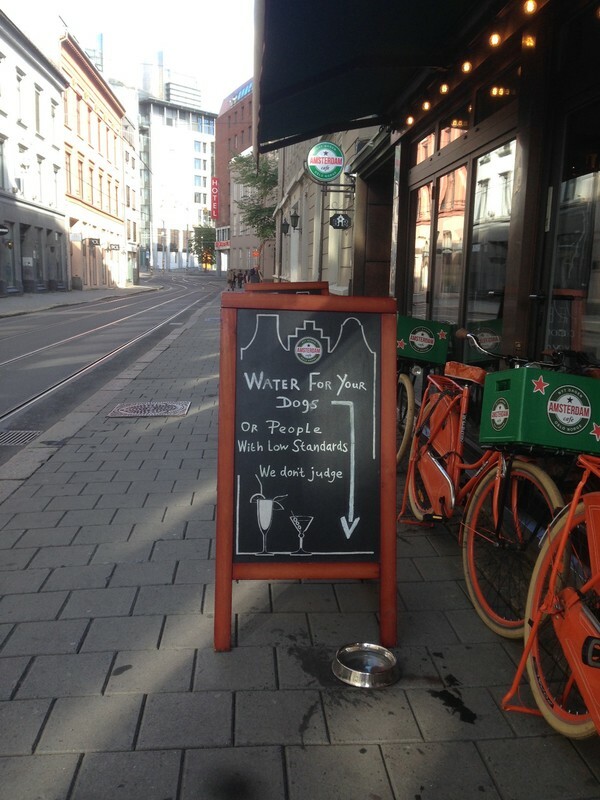 At least we got to see a sample of Norwegian humor in front of a bar next to the restaurant. The next day we embarked on the full day walking tour we always do in a new European city. 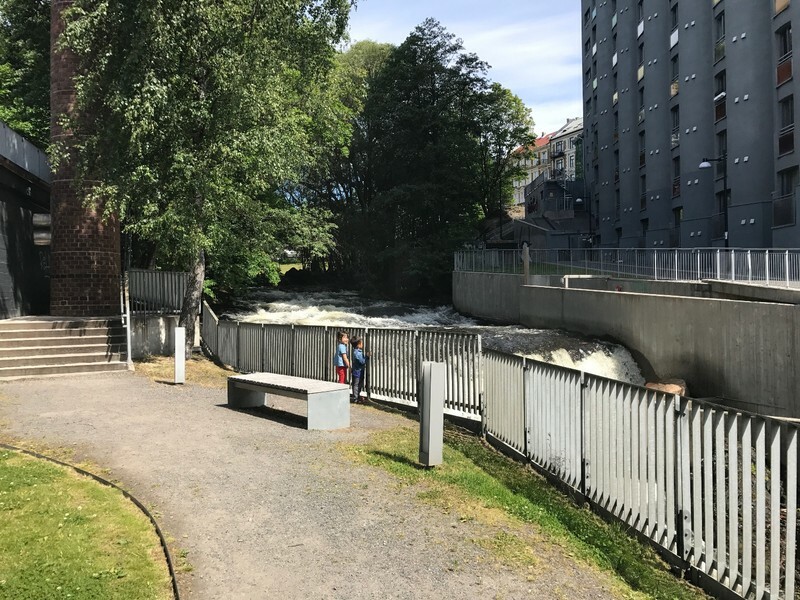 We walked through the large graveyard where Edvard Munch is buried to Mathallen, the best-known food hall in Oslo. As usual when we arrived early at a food hall in Scandinavia, we had the place pretty much to ourselves. The atmosphere and variety was similar to Torvalleherne in Copenhagen and Saluhallen in Gothenburg. 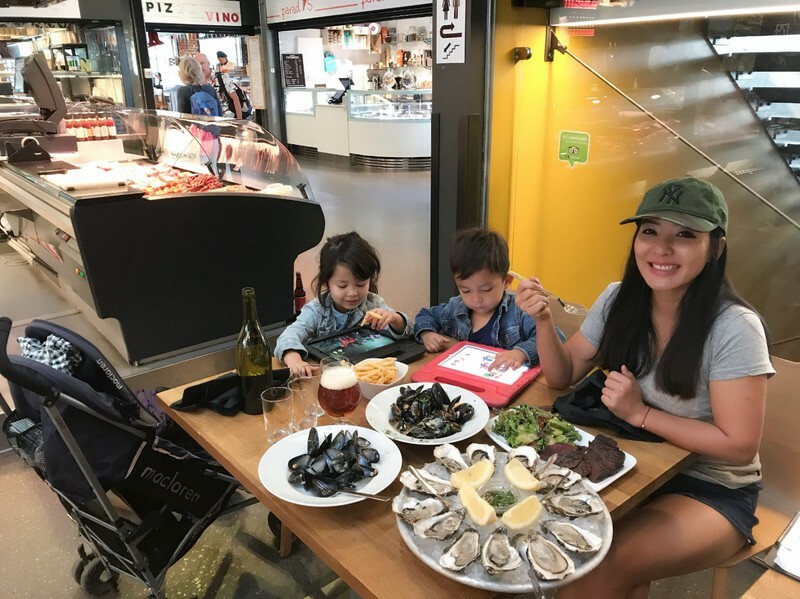 We found a seafood market and restaurant just as the kitchen was opening, and convinced them to cook us some whale meat even though it wasn't on the menu. Along with some luscious oysters and savory clams, the meal at VulkanFisk was quite delicious. It was only the second time in my life I'd tried whale meat, after having it as sushi in Tokyo a few years earlier. 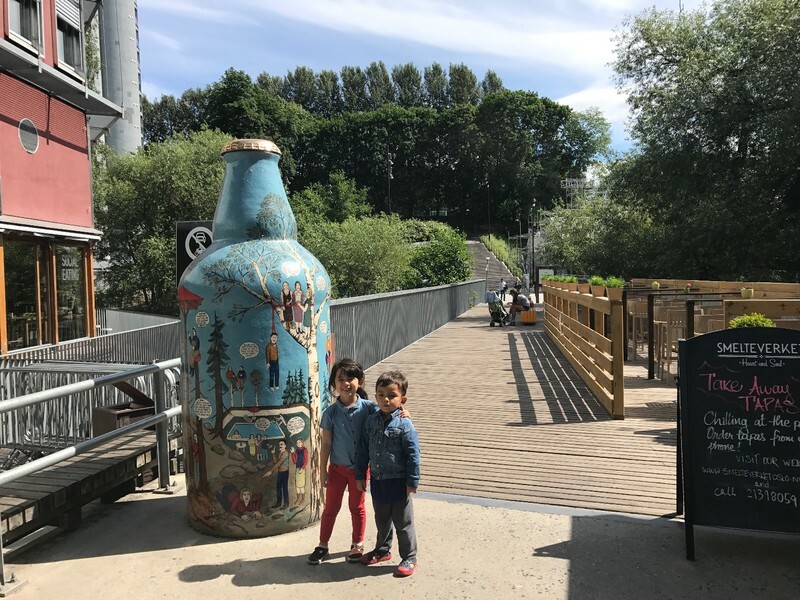 We walked south along the bank of the Akerselva River, which we eventually crossed at a bridge whose entrance was guarded by a very oddly muralized giant beer bottle. Just upstairs from the other side of the bridge, we found ourselves in Oslo's hipster neighborhood Grünerløkka. It was an attractive, upbeat little community. I left everyone in a park while I went to 7-Eleven to inquire about my nonfunctional Danish and Swedish SIM cards. Naturally, the end result was having to buy a Norway SIM card. 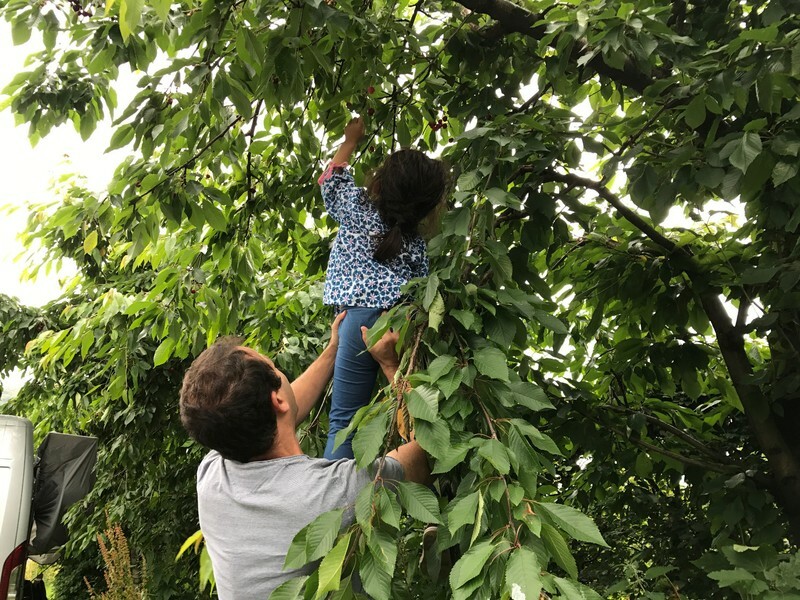 I withdrew cash just in time to pay for the cherries that Mei Ling and the kids had already grabbed from a fruit stand in the park. 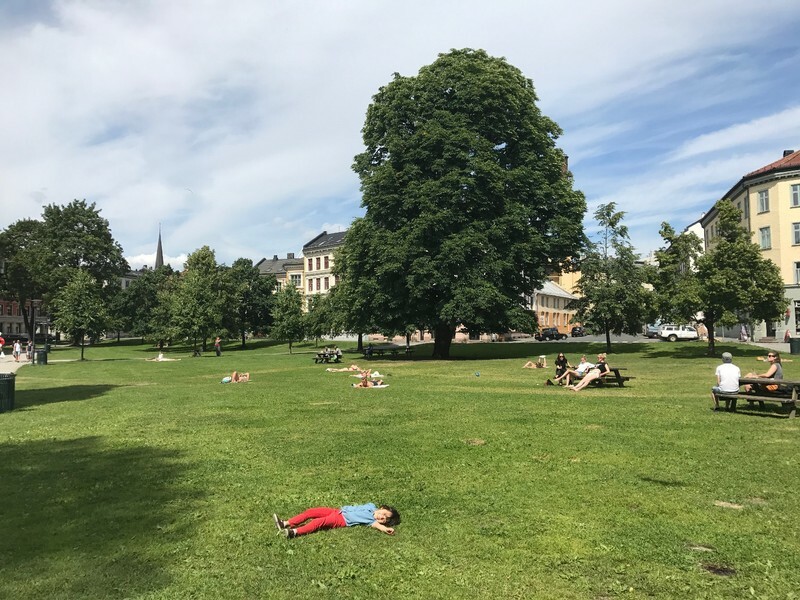 The galleries and cafes in Grünerløkka weren't of much interest to us, so we meandered east through the large park Sofienbergparken where lots of people were sunning themselves on the grass and picnicking. 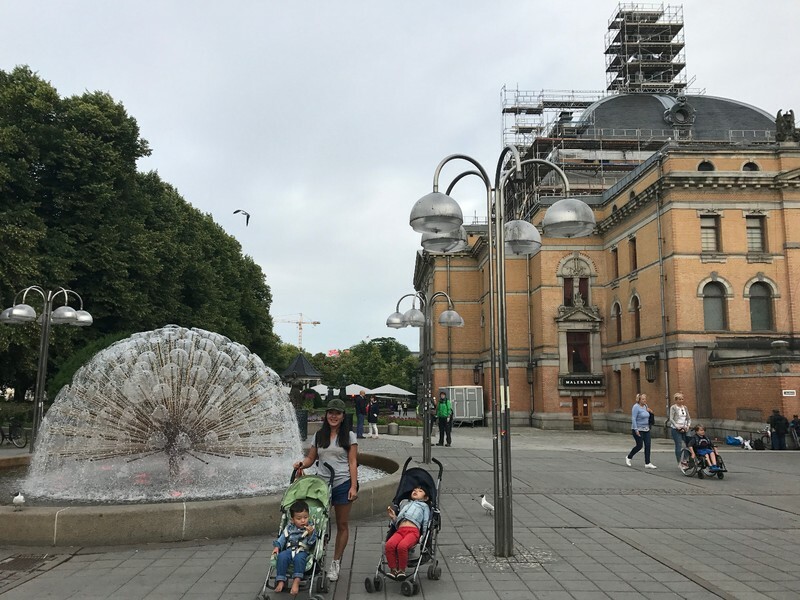 Then we crossed Akerselva again into Torggata, another busy downtown neighborhood, where we briefly visited the well-known seafood market and restaurant Fiskeriet Youngstorget. 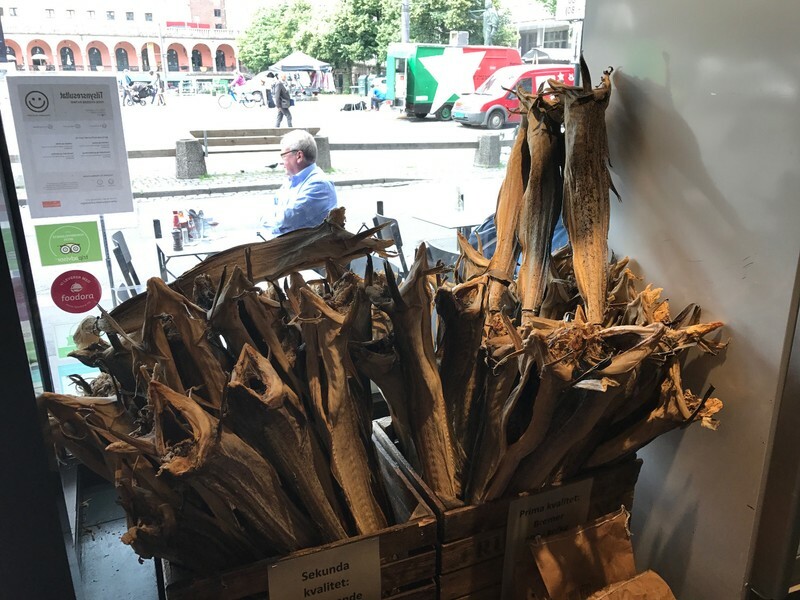 The crates of dried fish were cool, but otherwise we didn't see anything to make us regret having eaten our fill at VulkanFisk in Mathallen earlier. 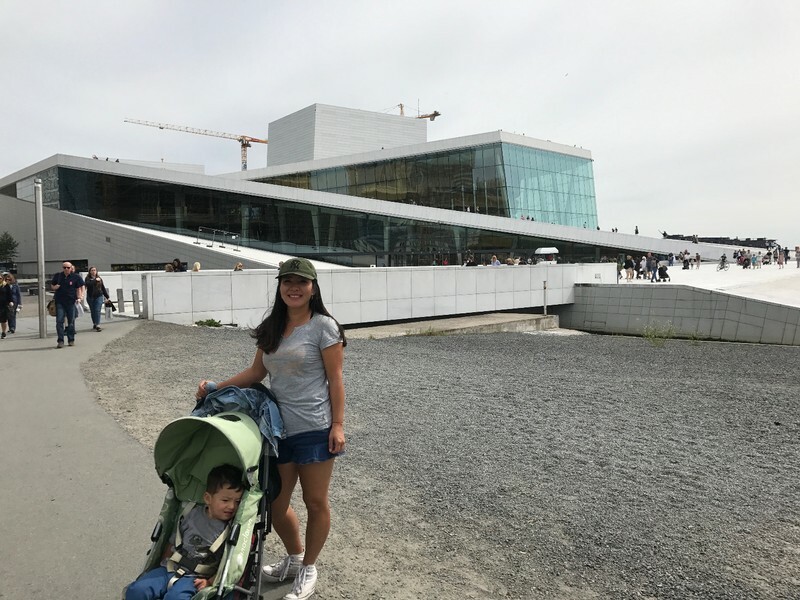 We stopped briefly at the central train station where I picked up the tickets I had reserved for our Norway in a Nutshell tour later in the trip, and then walked a little further to the waterfront and Oslo's famous Opera House. 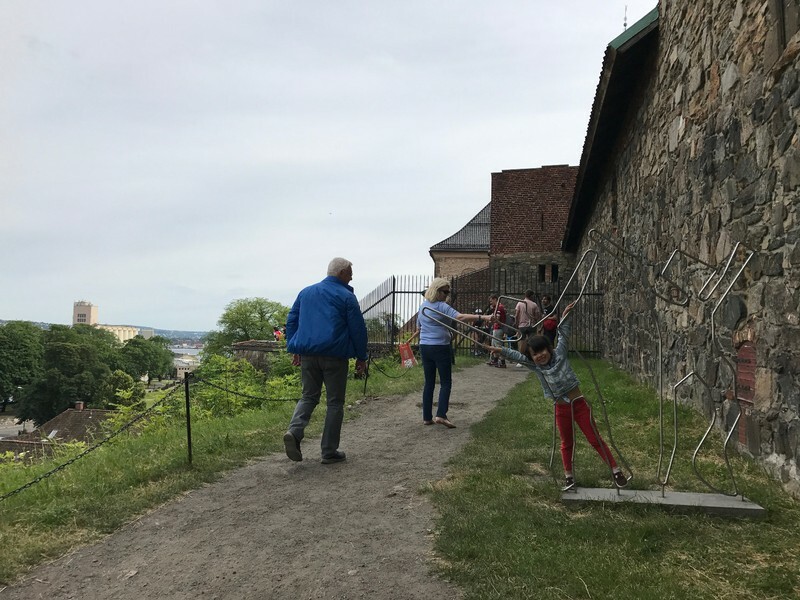 The most unique feature of this ten year old structure is the long walkway which slopes gently from the roof level to the ground, allowing visitors to walk up to the roof fairly easily. The walkway continues downward past ground level all the way to the water's edge. 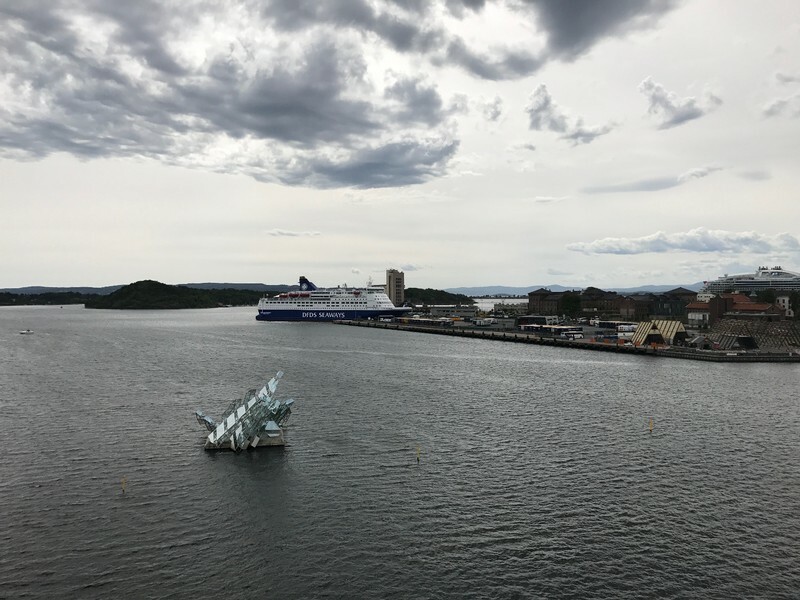 In the harbor nearby is the steel and glass "She Lies" sculpture. We all climbed the walkway together to the roof. It's steeper than it looks from the ground and the kids loved fighting against the slope and exploring the contoured roof. 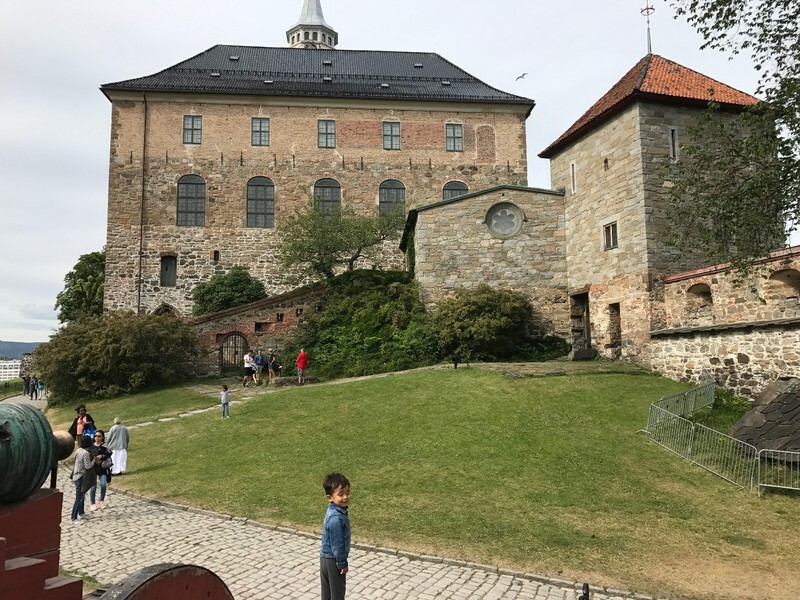 On a promontory between the Opera House and the ferry terminal is the 13th century Akershus fortress. We spent about an hour wandering around outside the impressive stone buildings. 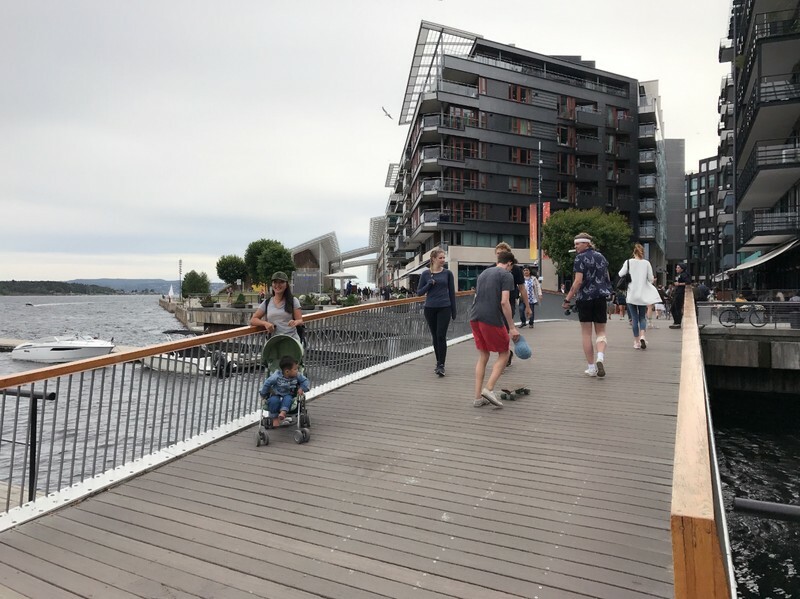 We continued our walk onto Aker Brygge, the touristy built-up wharf complex. Unsurprisingly, the boardwalk was lined with unappetizing generic restaurants crowded with tourists. There was also a surprising amount of residential housing, in modern angular apartment blocks. We already had a destination in mind having been recommended Rorbua for dinner by the staff at VulkanFisk that morning. Rorbua proved to be a little bit touristy as well, but their versions of traditional Norwegian game dishes were much more satisfying than what we had the previous night. We were happy to break our short streak of lousy restaurant dinners. As the late Norwegian dusk began to settle in, street performers were entertaining the growing crowds headed back and forth between the city center and Aker Brygge. Cleo got a supporting role in one comedian's performance. 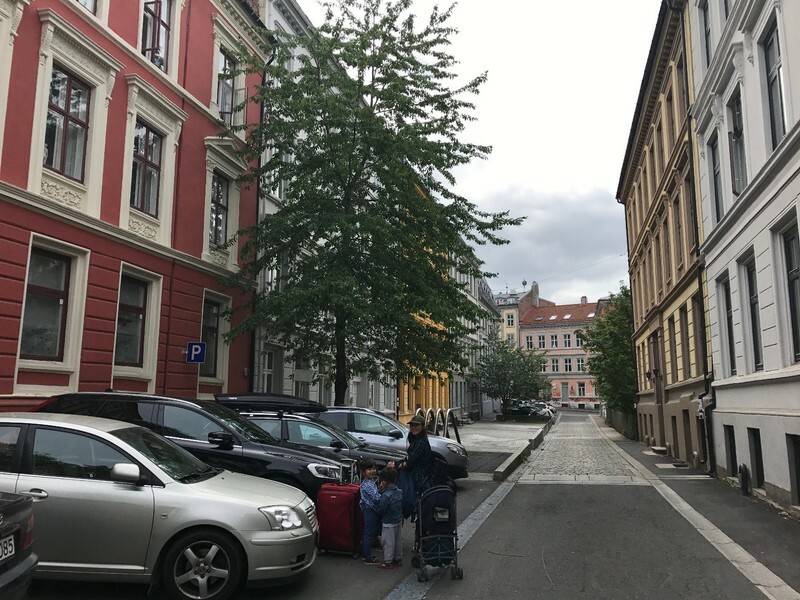 We had completed most of a circle around central Oslo over the course of a day and just had a half hour walk back to our Airbnb. 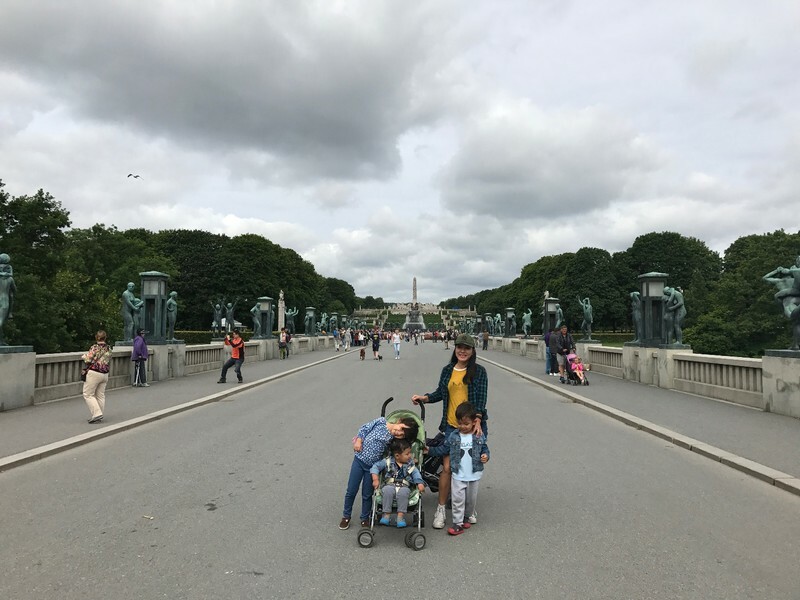 We walked back through the center, passing between the National Theater and Slottsparken, home of the Royal Palace. We briefly thought about walking into the park to see the palace but concluded we were too exhausted and called it a night. 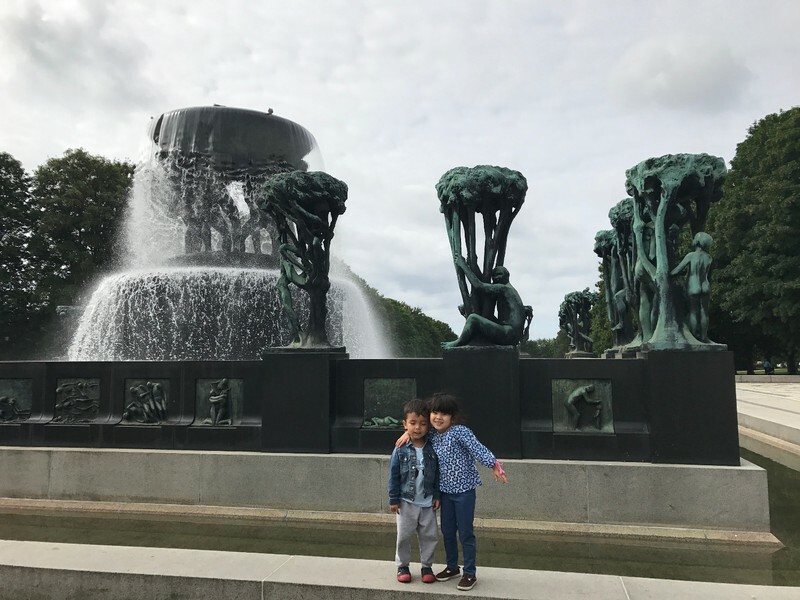 We spent our second and last morning in Oslo at Vigeland Sculpture Park inside Frognerparken. 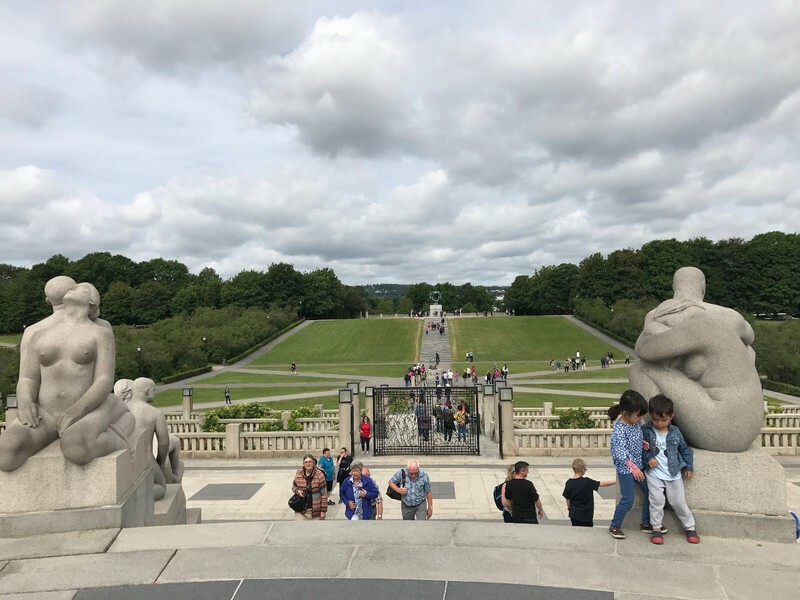 All the works in the park are nudes by Norwegian sculptor Gustav Vigeland, and they vary from comical to disturbing. The setting was beautiful, especially when viewed from the elevated platform that houses the central monolith of entwined human figures. 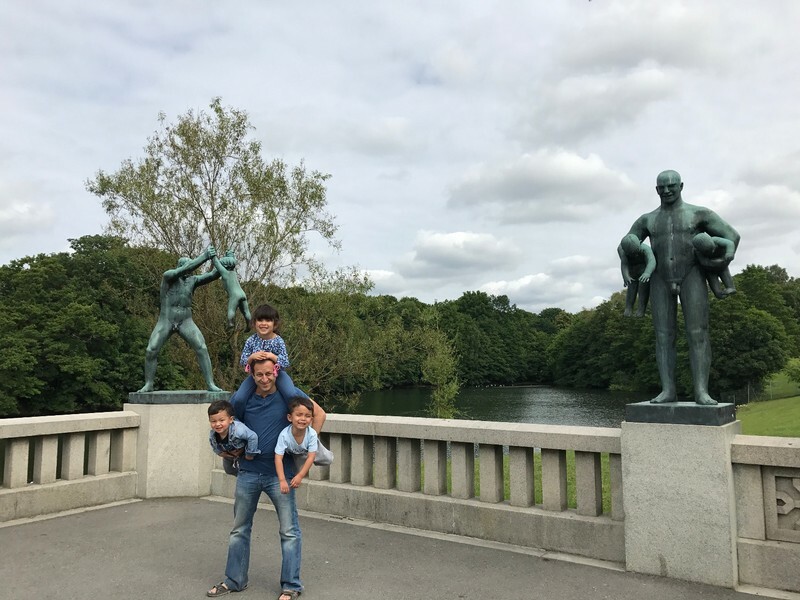 The kids and I created our own version of a Vigeland sculpture, although out of respect for the tour groups we chose not to disrobe. Frognerparken had an elaborate playground with tunnels and suspension bridges that the kids enjoyed for about an hour. 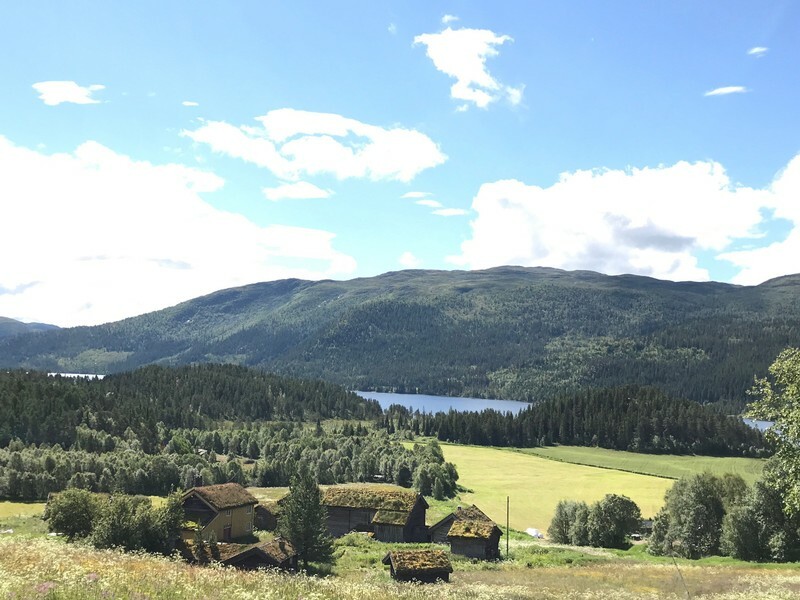 After a so-so lunch at a Thai-inspired noodle shop, it was time to set off for Norway's interior. 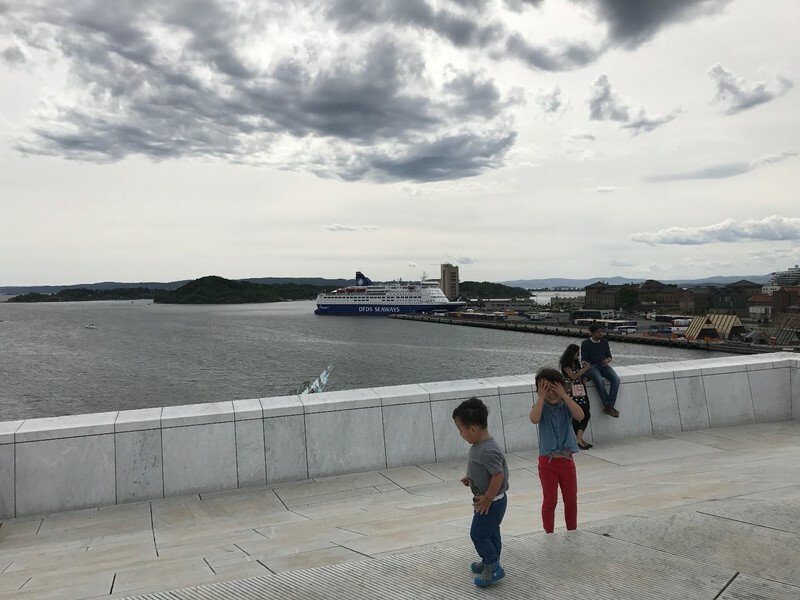 In parting, here's a great local's guide to Oslo.